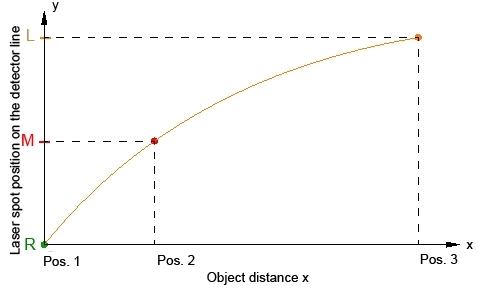 The term distance measurement not only comprises the distance between sensor and object, but also e.g. 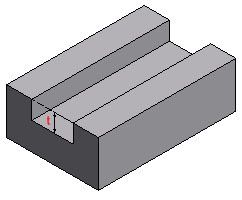 the thickness or width of an object. The measurement of length, height and depth also belongs to this category, as well as the measurement of diameter, and gap-size measurement. 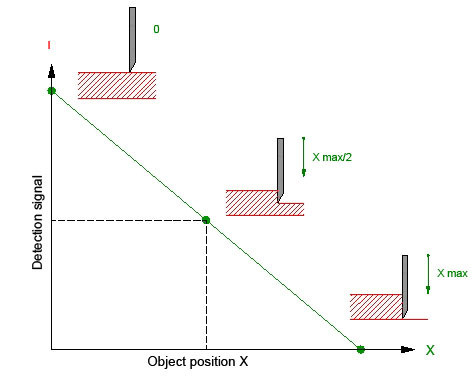 For positioning what matters is not the size of a certain object, but the position of the object in the detection range. 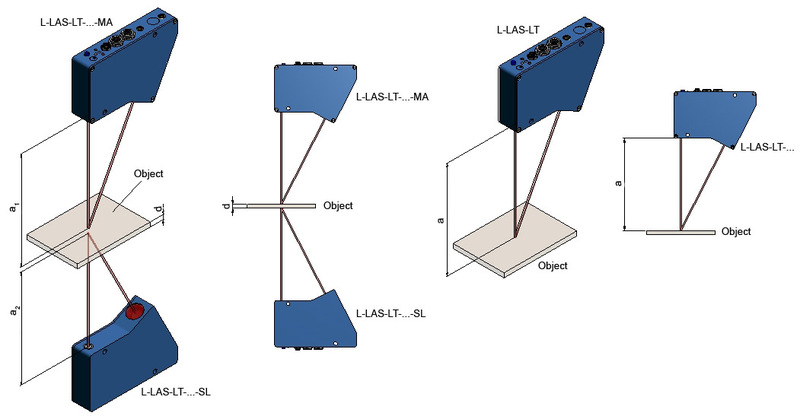 Height can be measured both with a reflected-light system of the L-LAS-LT SERIES and with a through-beam system of the L-LAS-TB SERIES or A-LAS SERIES. 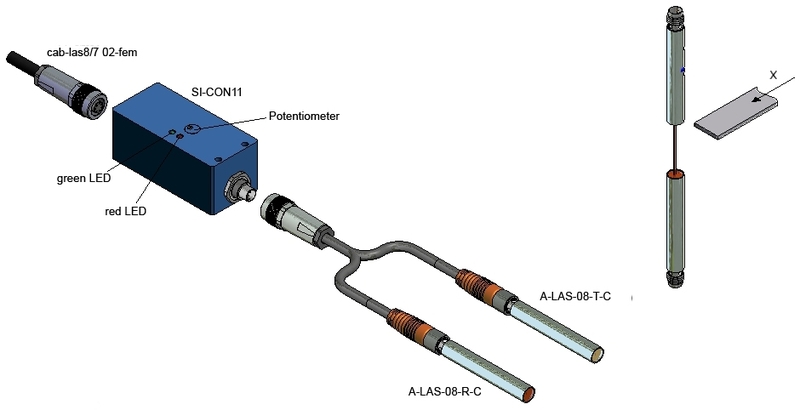 The required measurement range is decisive for the use of a certain sensor type, and the speed of the object also must be taken into consideration, and here the A-LAS series performs best. 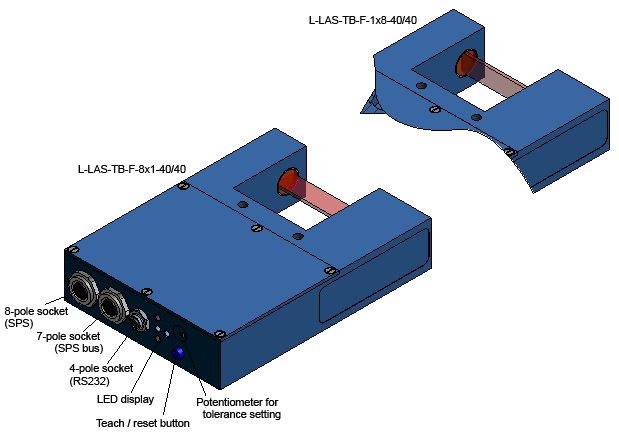 If the measurement frequency is of less importance (<middle) the advantage lies with the L-LAS-TB system, because a higher accuracy can be achieved here due to the high pixel number. 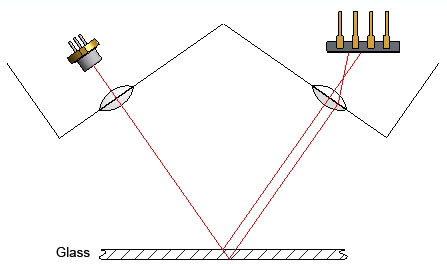 With this measurement principle the light source (laser), the surface to be measured, and the detector are arranged in the form of a triangle. 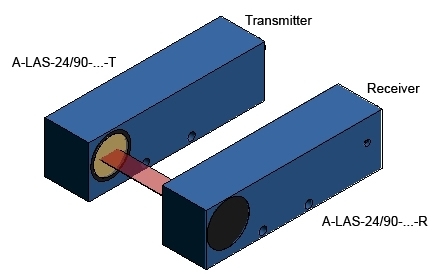 With a transmitter optics unit the laser spot of the laser diode is projected onto the surface of the object. 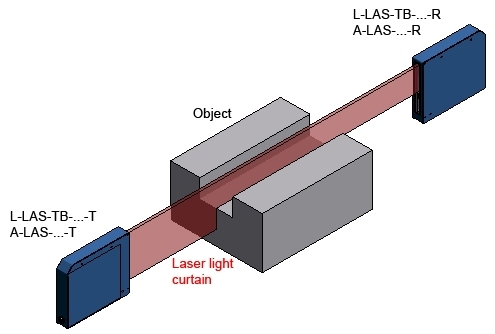 Through the receiver optics some of the laser light that is scattered from the surface into the half-space reaches the detector line. 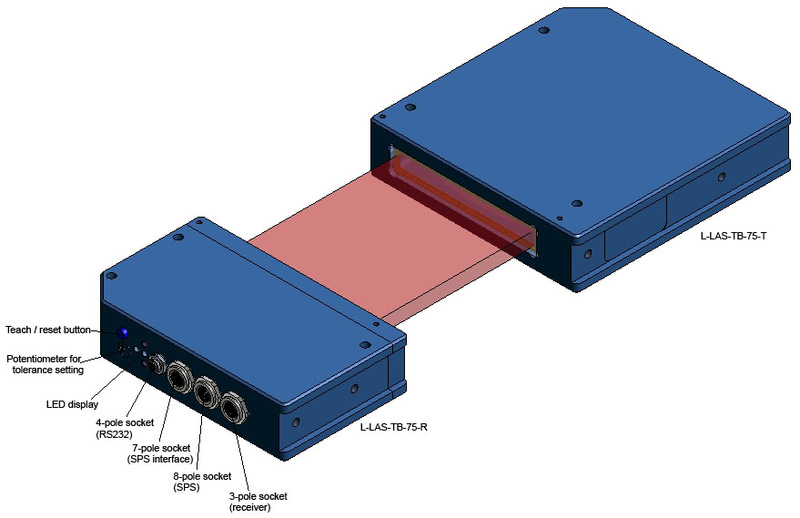 The line sensors comprises several small photosensors (pixels) that are arranged in a row (depending on the line type 128, 256 512 and 1024 pixels). The signal of those pixels that are hit by the laser light. 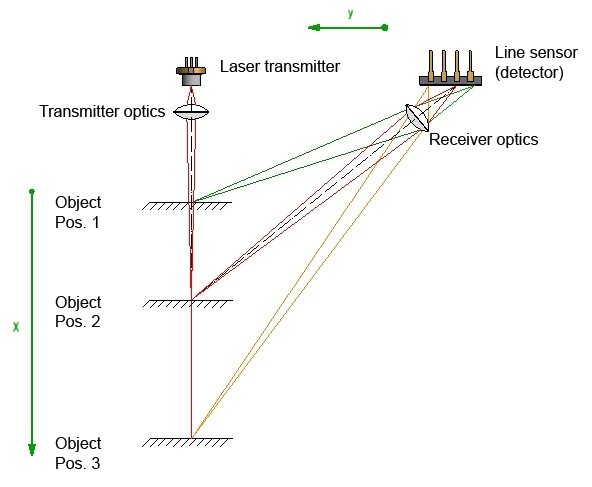 The relation between object distance and laser spot position on the detector line is not linear. 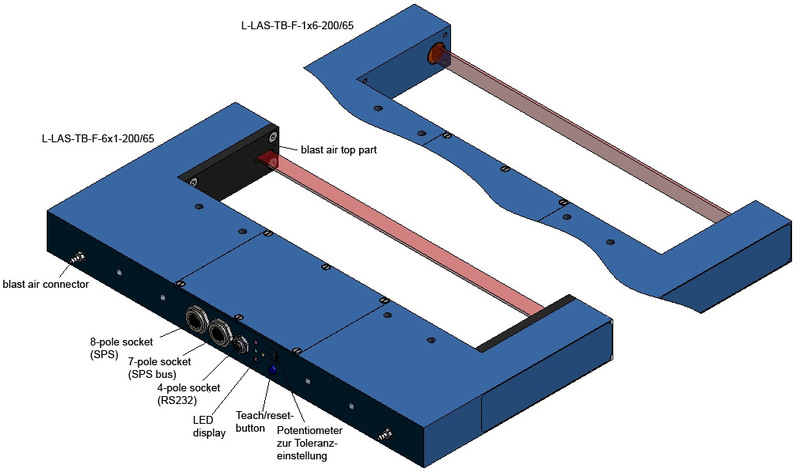 Corresponding linearization of the laser sensor is performed with the help of a reference system. 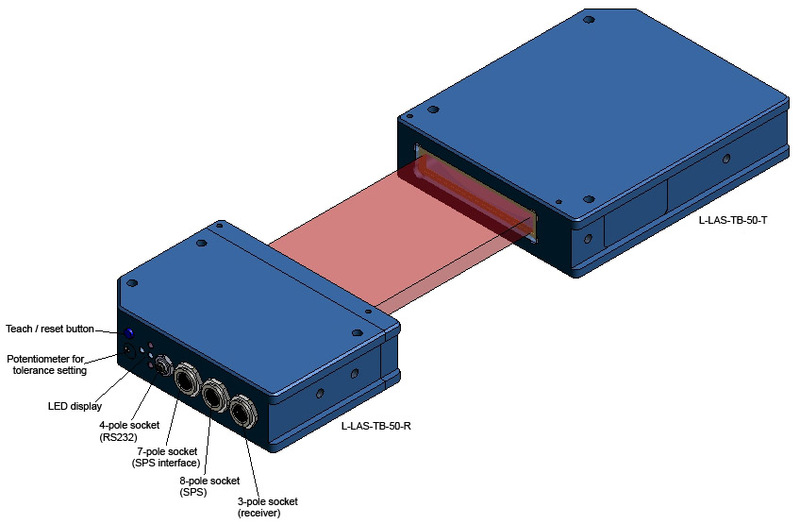 The accuracy of the laser sensor can be further increased by means of sub-pixeling and averaging. In practice the accuracy is increased by a factor of 4 by sub-pixeling. 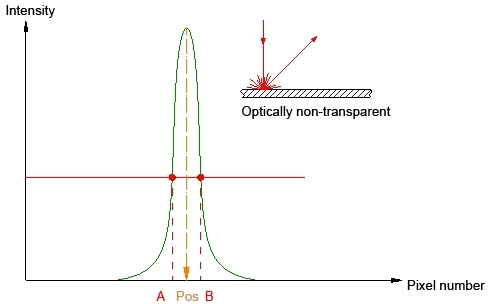 If the laser spot hits optically non-transparent objects, e.g. metallic surfaces, it is symmetrically mapped on the line. 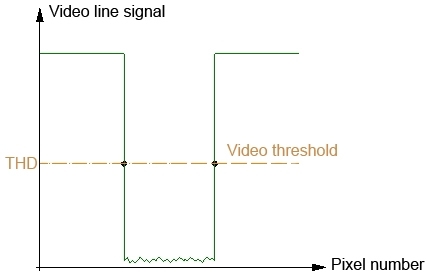 In this case both pixel positions of the video signal are used for evaluation when they cross an adjustable video threshold. With semi-transparent objects, e.g. 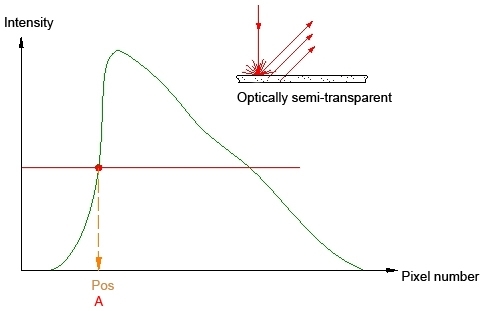 soft wood or milky plastics, it may be of advantage to only use the first threshold crossing: POS=A, which improves the detection of the actual surface. With reflecting surfaces or with transparent objects almost no diffuse reflection is generated at the surface. 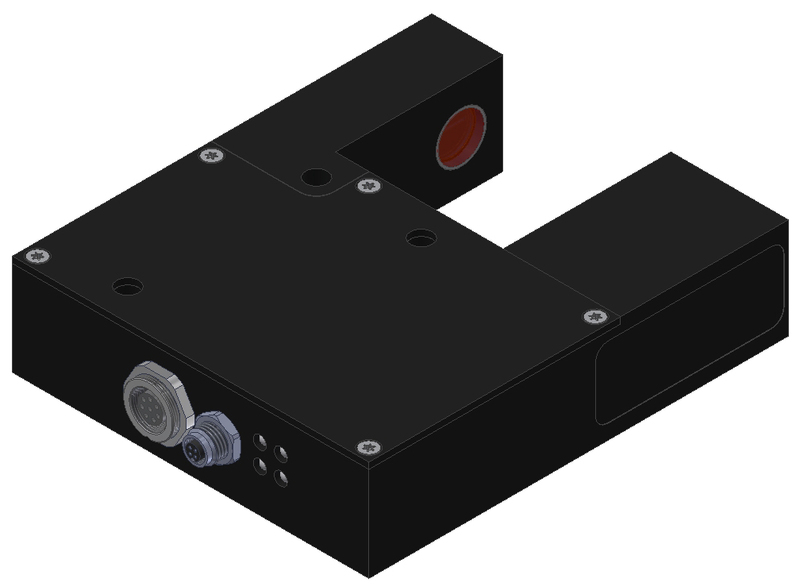 For the receiver to "see" the laser spot on the measuring surface, the laser sensor must be turned into direct reflection. In case of transparent objects, e.g. glass plates, there also may be double reflection (glass top and bottom side). 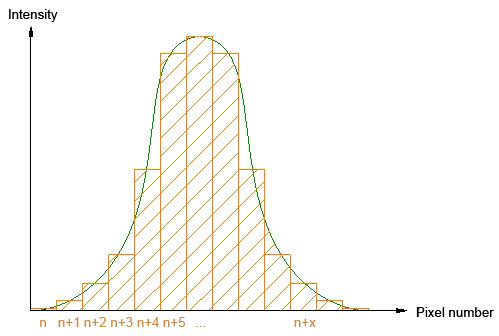 In this case the peak that is generated on the detector line by the bottom glass surface is not evaluated. In this measurement care must be taken that the reflected laser beam does not leave the receiver optics, i.e. tilting movements of the object should be minimised. 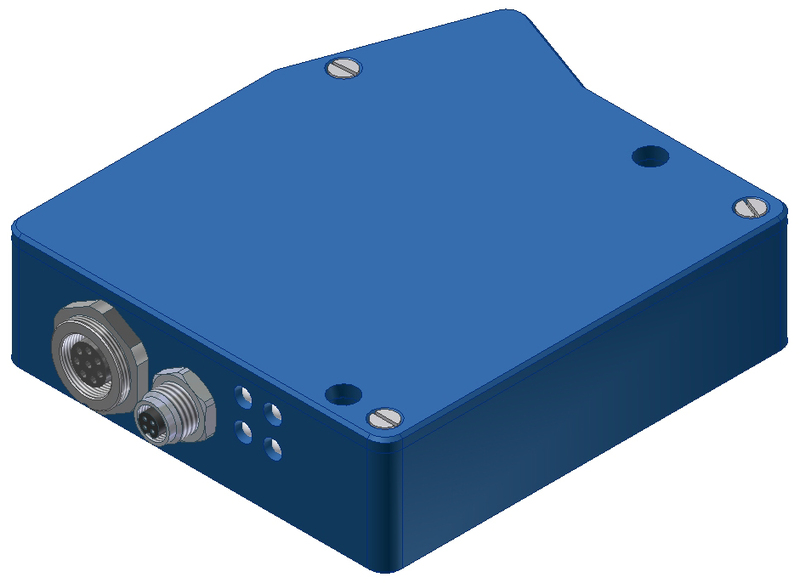 In triangulation sensors with integrated detector line extraneous light is suppressed by means of interference filters, i.e. 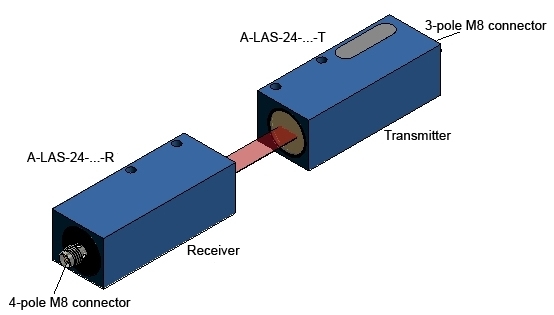 only the wavelength range of the laser light reaches the receiver. 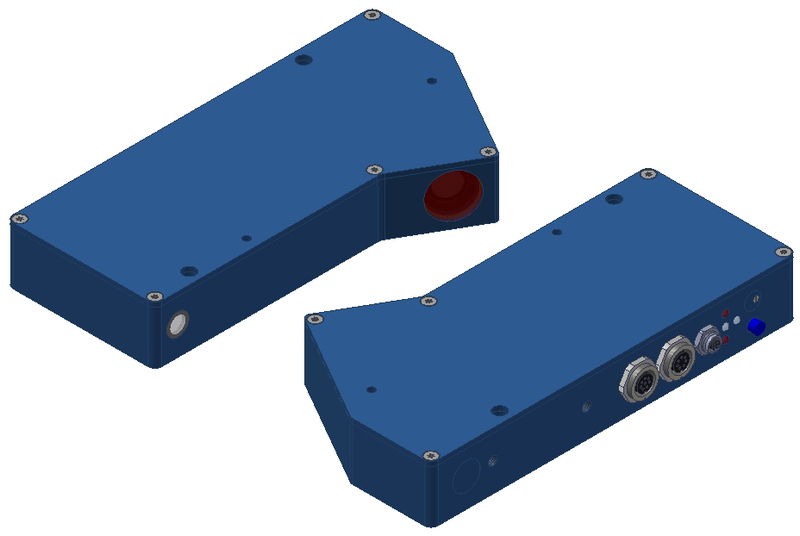 By way of automatic laser power adjustment the laser sensor optimally adapts itself to dark or bright objects. 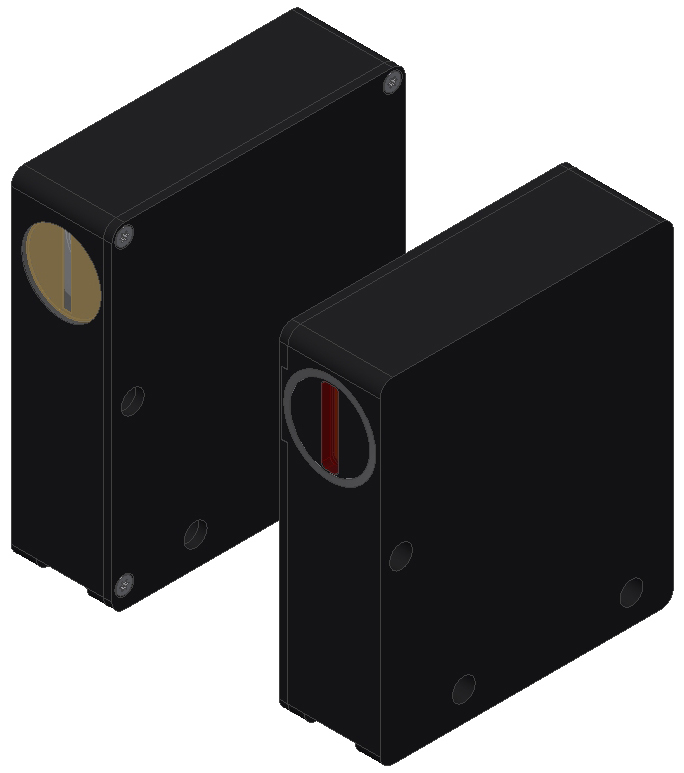 The laser sensors of the L-LAS-LT series cover a distance range of approx. 1000 mm. 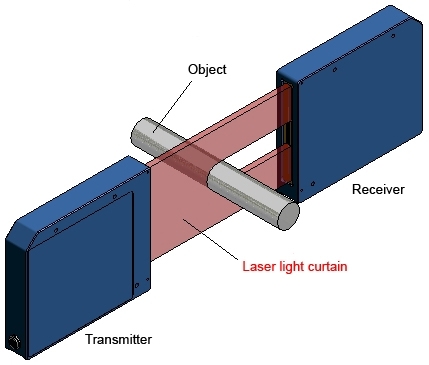 In this through-beam method a part of the parallel laser light curtain is covered by the object. 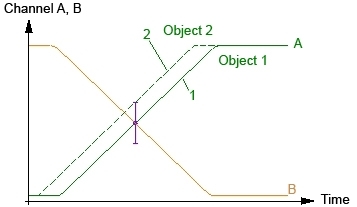 The level of beam covering approximately is proportional to the signal decrease at the receiver. 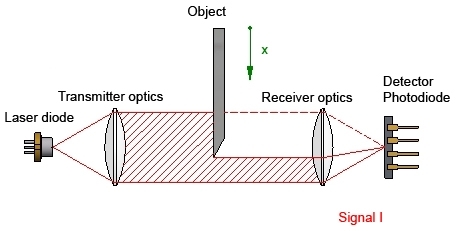 The light arriving at the receiver optics is focused on a detector. 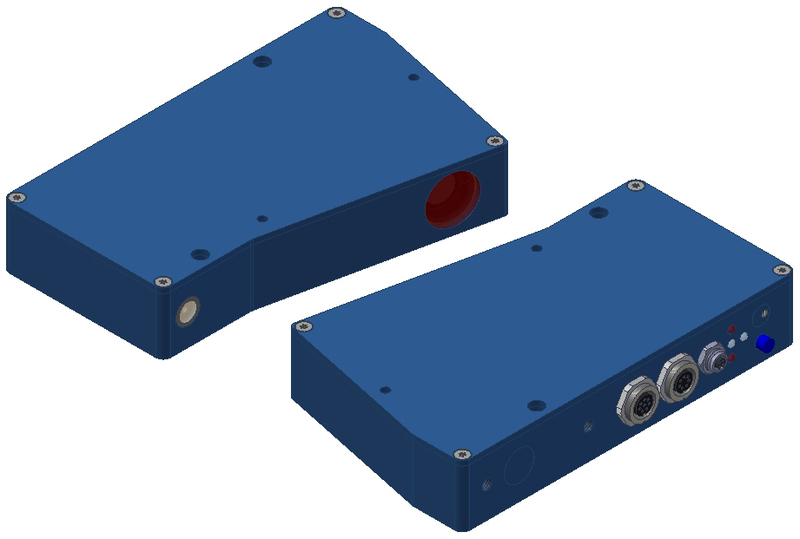 The A-LAS series primarily is used for the distance measurement of fast moving objects. 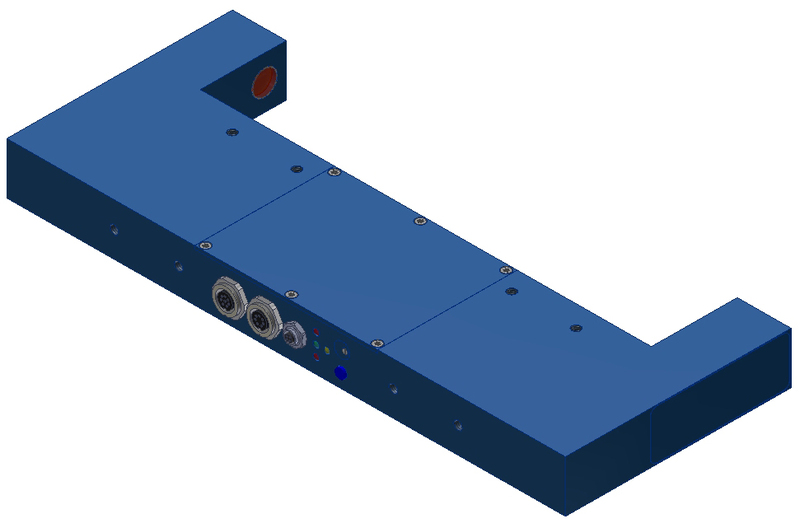 Dirt accumulation compensation is performed during the time when there is no object in the laser light curtain. 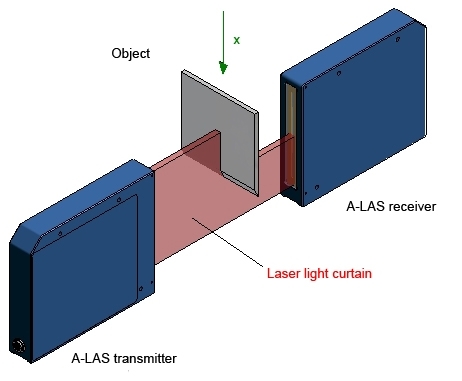 The laser light curtains of the A-LAS series have a height ranging from 0.2 mm up to 100 mm. 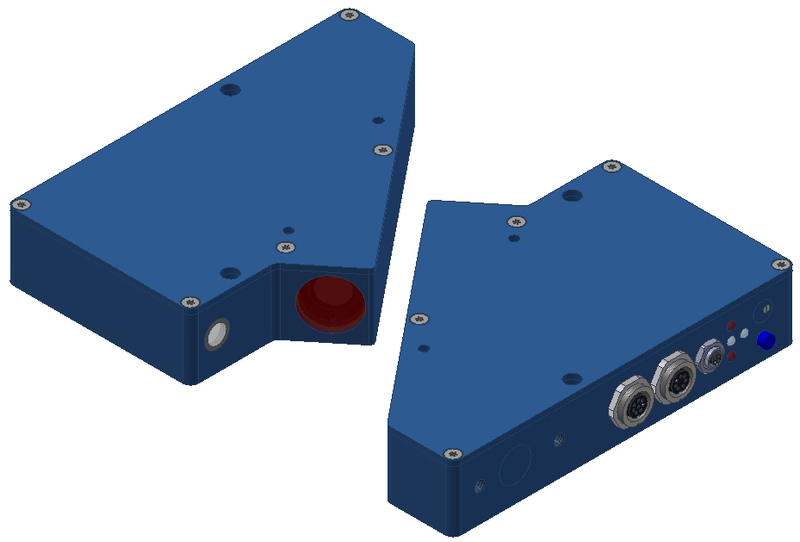 The sensors are available as fork-types (transmitter and receiver in one housing) and as split types. Extraneous light suppression is achieved by corresponding optical filter and aperture technology. 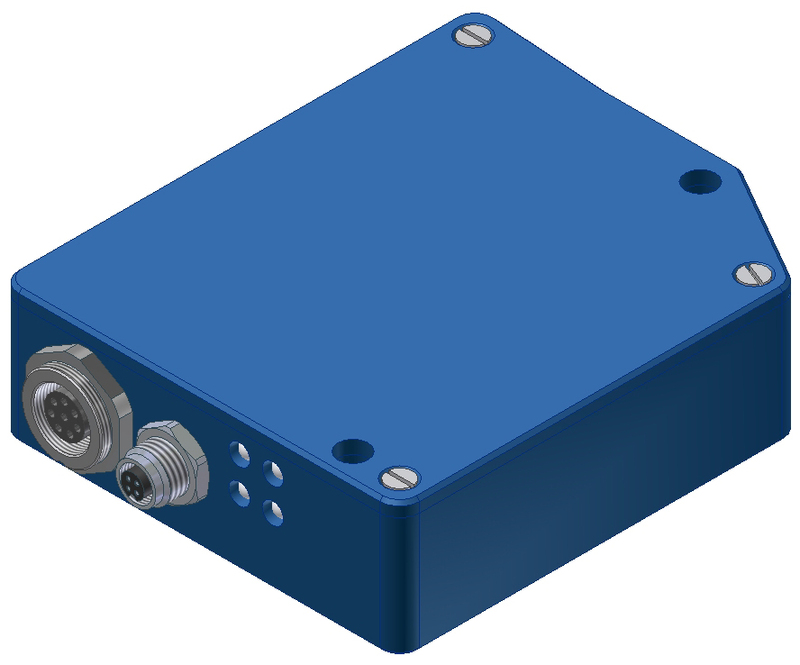 The sensors of the A-LAS series are available with different evaluation units that either provide the object position in analog form (0V…+10V or 4 mA to 20 mA) or through a serial interface. 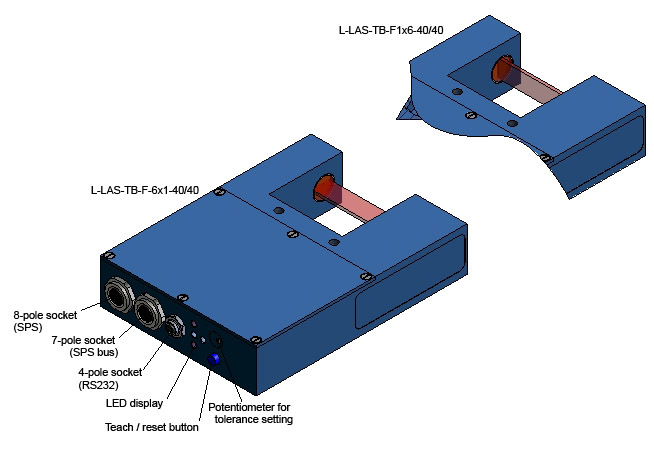 The transmitter unit of the L-LAS-TB series provides a collimated laser light curtain which on the receiver side impinges on a line detector. 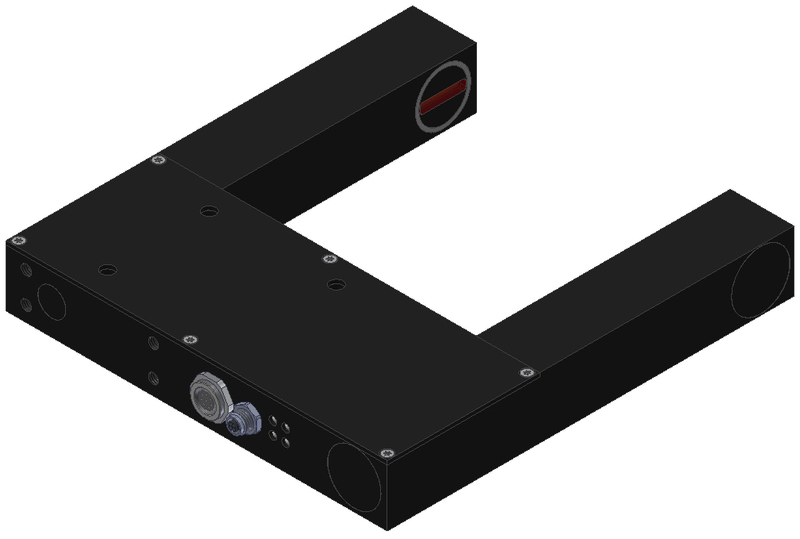 When an object is in the laser light curtain, the parallel light guarantees a "sharp" shadow on the detector line. 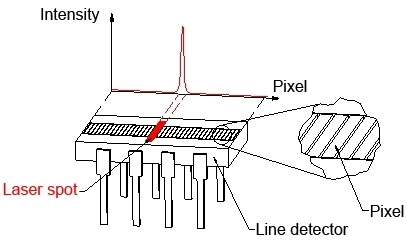 The detector line holds several hundreds of small photosensitive elements that are referred to as pixels (128 pixel, 256 pixel, 512 pixel, 780 pixel, 1024 pixel, 1200 pixel and 1560 pixel). When laser light impinges on the pixels they are illuminated, which results in a signal increase at these pixels. Non-illuminated pixels do not provide a signal. 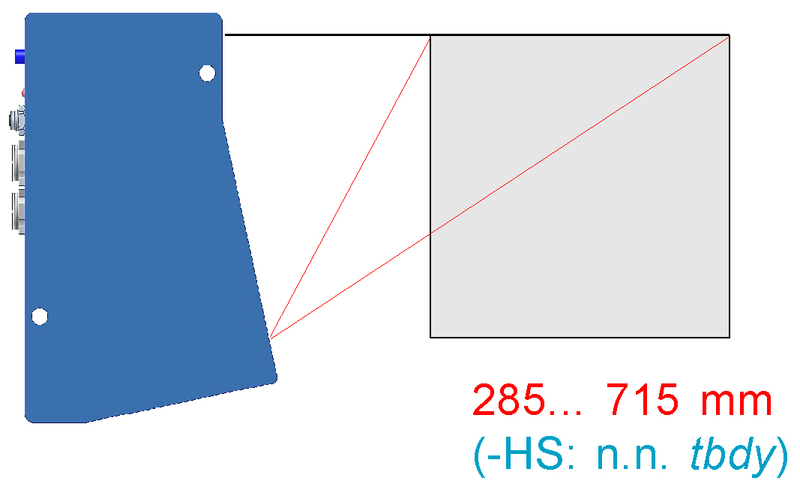 If, however, a pixel is half covered by the object shadow, the signal is at half height. 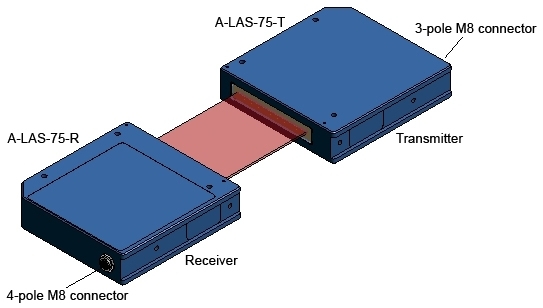 The pixel signal is converted by the A/D converter that is integrated in the sensor processor. 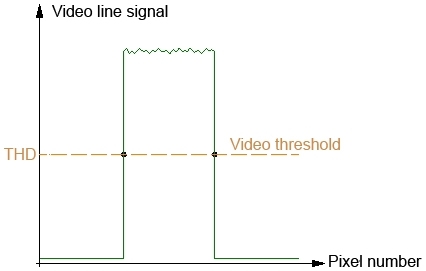 The controller in the receiver then compares the video signal of every pixel with a specified adjustable threshold. Pixels at which a crossing of the threshold is determined inform about the position of the "shadow edge" (shadow start or end). 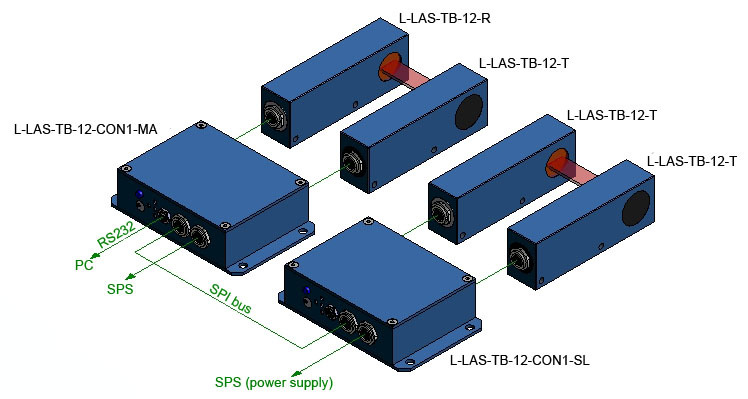 A measuring accuracy starting from 2 μm (depending on the measurement range) can be reached with the laser sensors of the L-LAS-TB series. 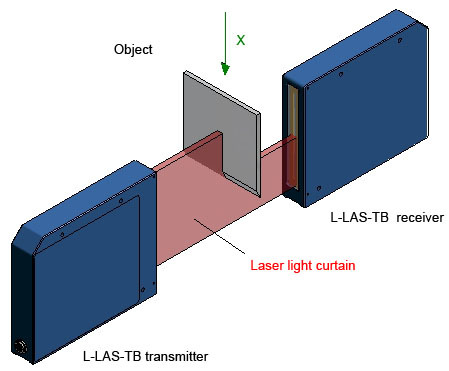 The L-LAS-TB series is available with laser light curtains ranging from 8 mm to 100 mm. 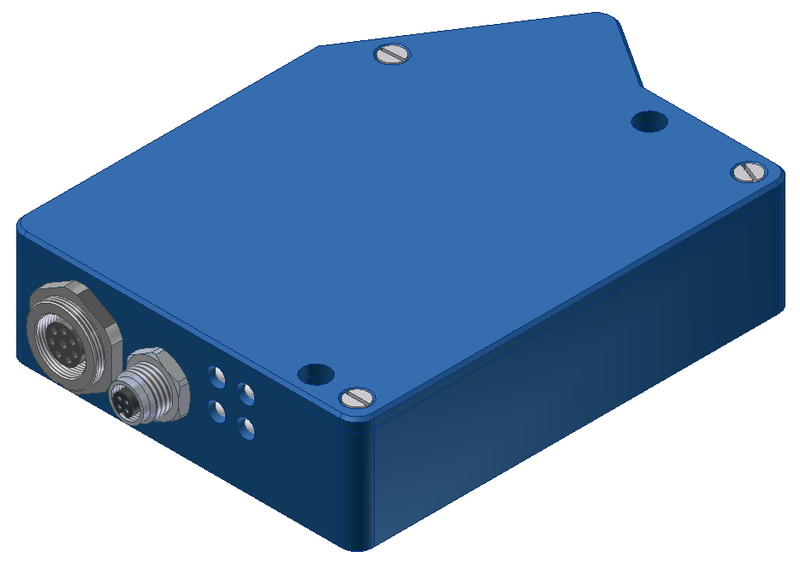 Apart from the fork versions, split versions (transmitter and receiver arranged separately) also are available and allow measurements over larger transmitter-receiver distances. A max. operating distance of 1000 mm is recommended here, but even 5000 mm have already been realised in practice. The light source is an array of white-light LEDs, the light of which by means of a diffusor is homogeneously directed onto the measuring surface. 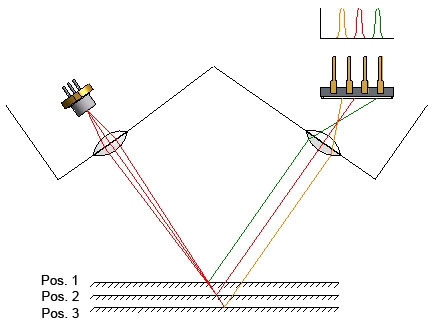 A precision lens maps a section of the illuminated surface on a line detector. 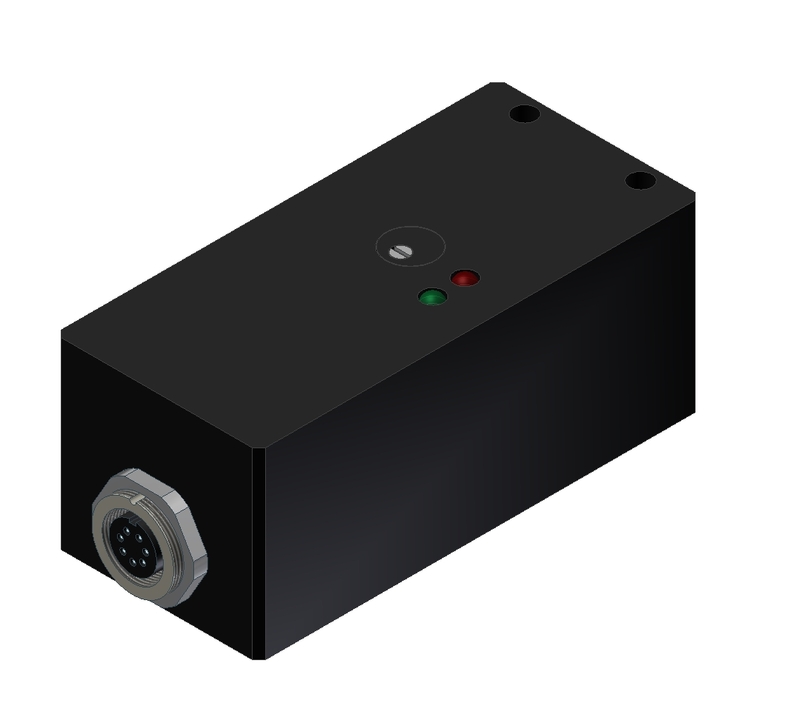 The video signal that is generated by the line sensor then is evaluated by the controller that is integrated in the sensor housing. 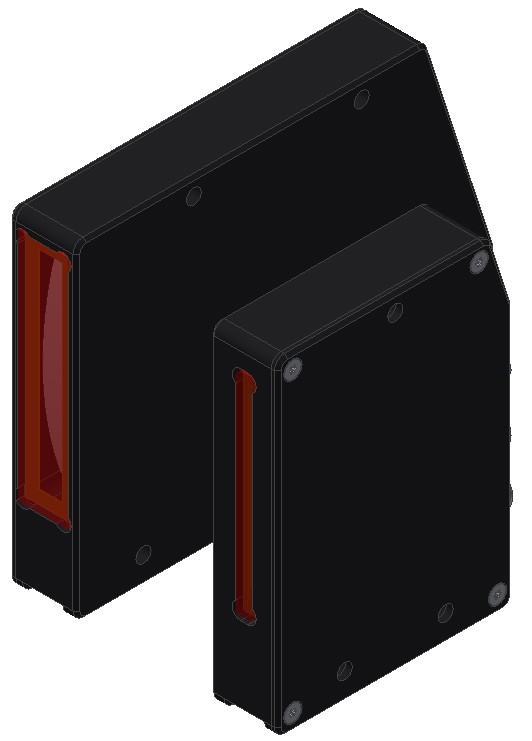 Apart from white-light LEDs, UV LEDs (detection of fluorescent objects) and IR LEDs also are available. UV blocking filters or daylight blocking filters are then used at the receiver side. 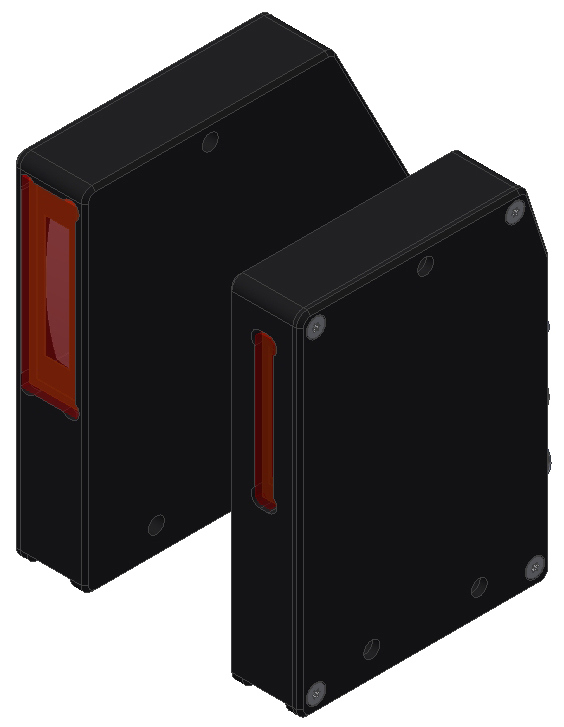 The L-LAS-LU series is available with LED light units of 50 mm to 500 mm in UV, white-light, and IR version. In case of white-light LEDs a diffusor is used in addition to ensure a homogeneous light distribution on the object. Different high-precision measurement lenses incl. various filters and intermediate rings are available for the line cameras (L-LAS-CAM series, focal length from 12.5 mm to 75 mm). 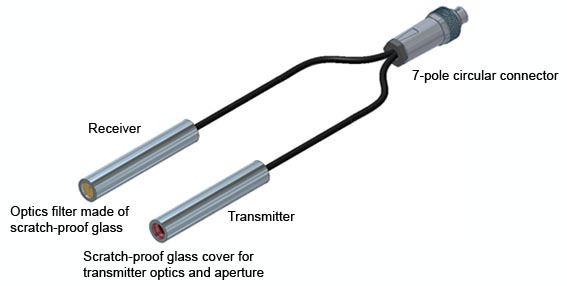 Line sensors are available with 256, 512 and 1024 pixels. 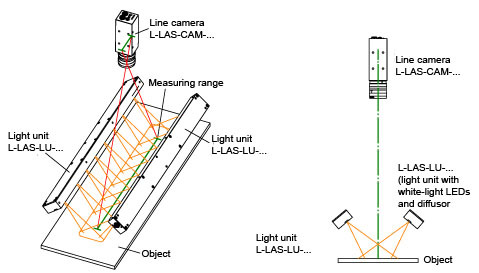 The system comprising L-LAS-CAM-… and L-LAS-LU-… can be used both in reflected-light and in through-beam mode. 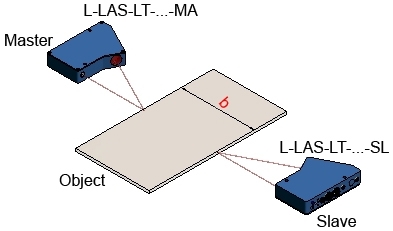 Either one or two light units of type L-LAS-LU-… can be used. The decisive factor for this is the surface structure or the surface form. 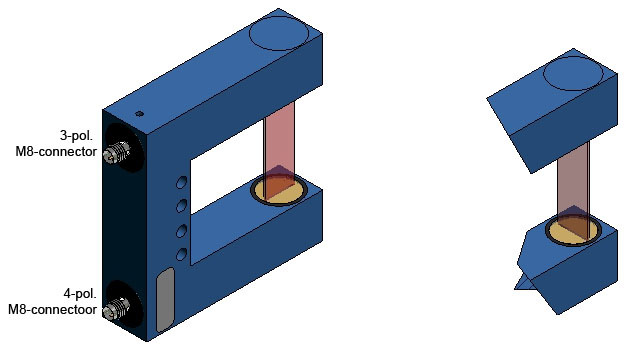 If the surface is flat and smooth, the reflected-light method offers slight advantages, because with the through-beam method due to the parallel laser light a protruding edge or a slight inclination of the object might influence the measurement result. 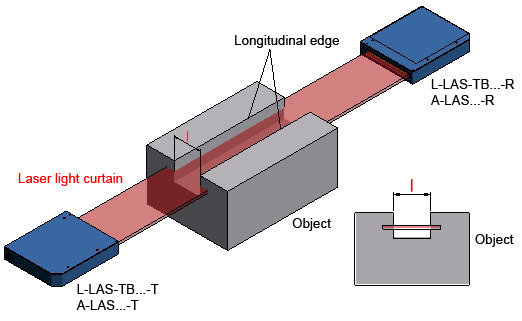 For objects with a curved or peaked surface, however, the through-beam method should be preferred, because here the highest point of the surface that the laser light curtain impinges on determines the measurement value. 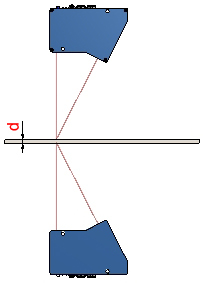 The through-beam system furthermore is insensitive to gloss or color changes of the object, because the shadow of the object is evaluated here. 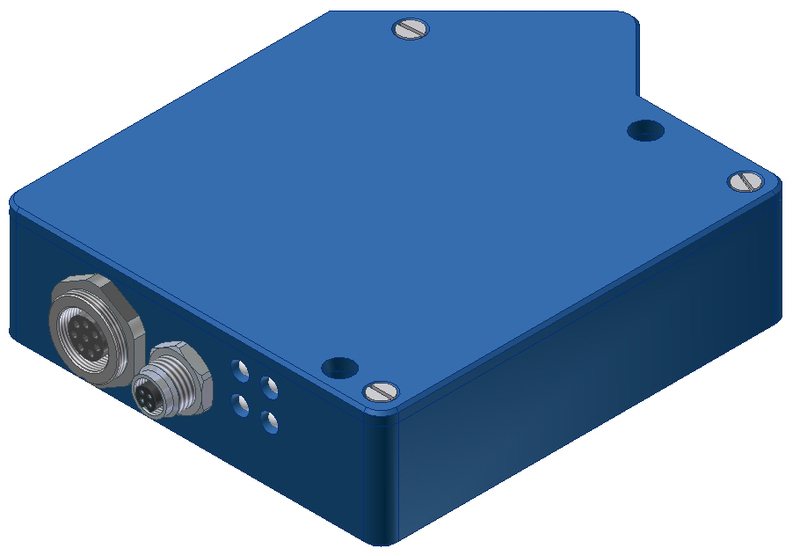 Transmitter and receiver unit also can be arranged at a larger distance from the object. 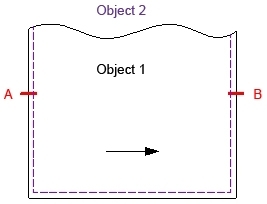 The object rests on a reference surface. Only the upper surface has to be measured. With certain limitations, depth can be measured both with the through-beam and with the reflected-light method. 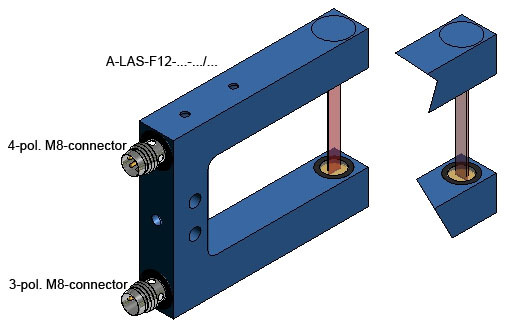 In the triangulation method care must be taken to ensure that the receiver has a free view field to the laser spot on the measuring surface. 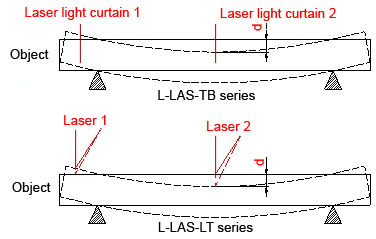 When using the L-LAS-TB-… through-beam sensor (A-LAS series) care must be taken to ensure that the laser light curtain can run along the measuring surface. 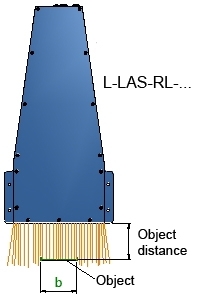 The A-LAS series can be used for fast-moving objects. 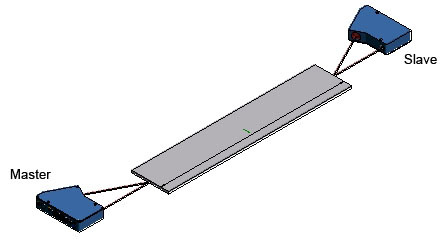 If the depth of a blind hole should be measured, a through-beam method cannot be used. 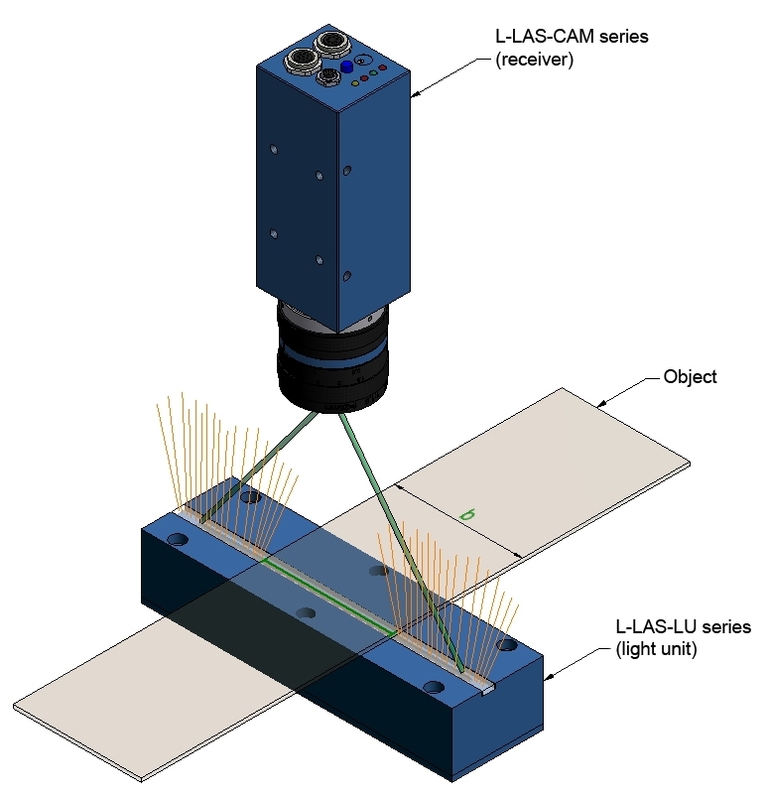 With the L-LAS-LT-… sensor care must be taken to ensure that there is visual contact between the laser spot that impinges on the measuring surface and the receiver optics. 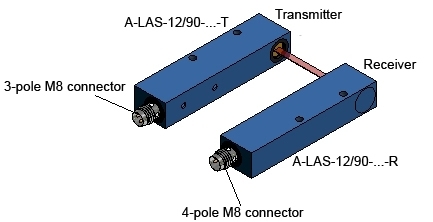 The A-LAS series especially is used when objects are moved at high speed. 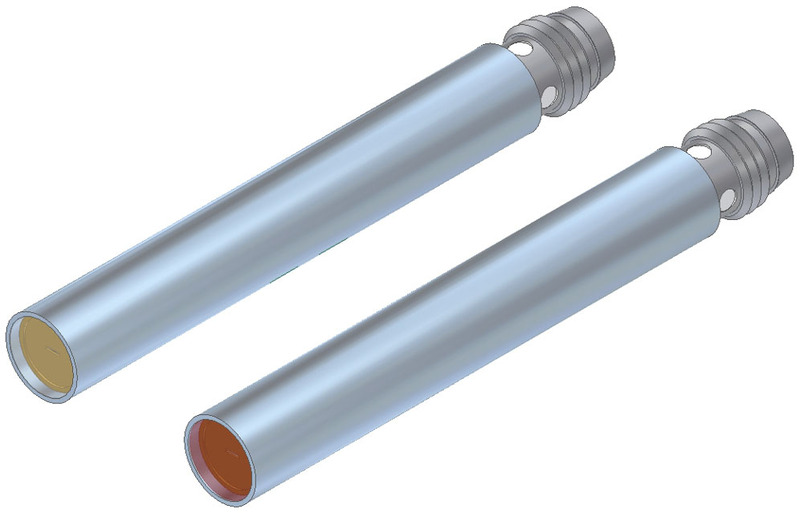 The sensors of the L-LAS-TB series are the best solution for determining the diameter of ball-shaped and cylinder-shaped objects. 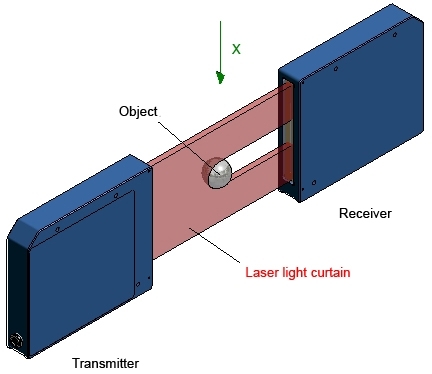 In case of larger objects (the object diameter is larger than the light curtain) the diameter also can be determined by using two laser light curtains. 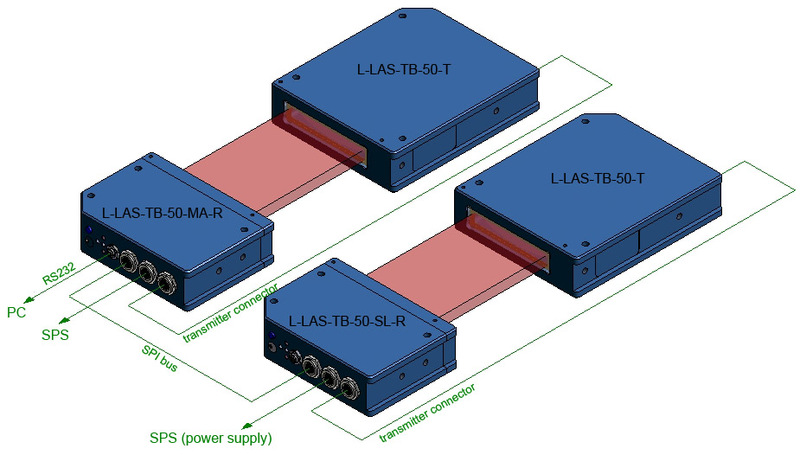 The two L-LAS-TB-… sensors then operate in master/slave mode, i.e. 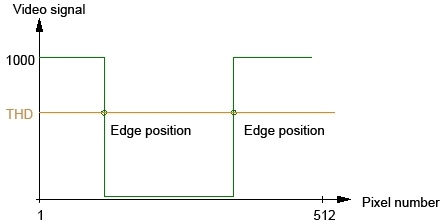 one sensor pair supplies the data of the edge position to the other sensor pair, which in turn determines the diameter from the two edge positions and an offset. 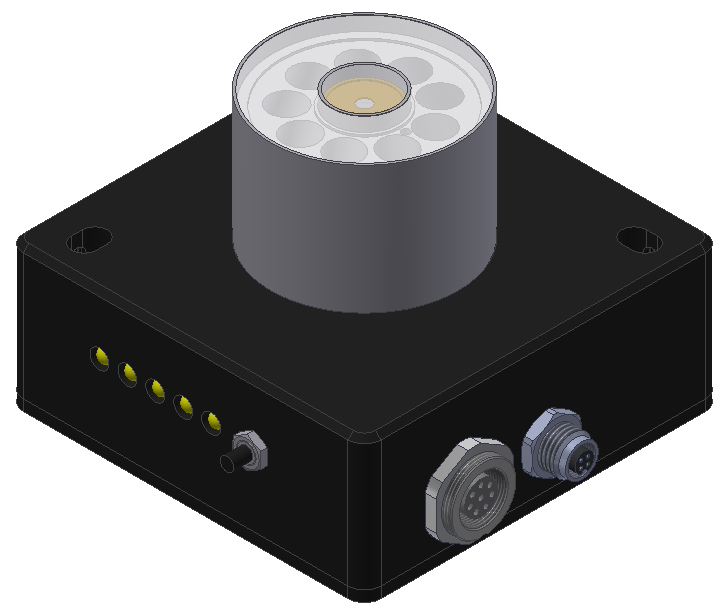 Data exchange between MASTER sensor and SLAVE sensor is performed though a special sensor interface, no external evaluation unit is needed to determine the diameter. The diameter value is provided in analog form as a voltage (0V…10V) or current (4 mA…20 mA), or as a numeric value on the serial bus. 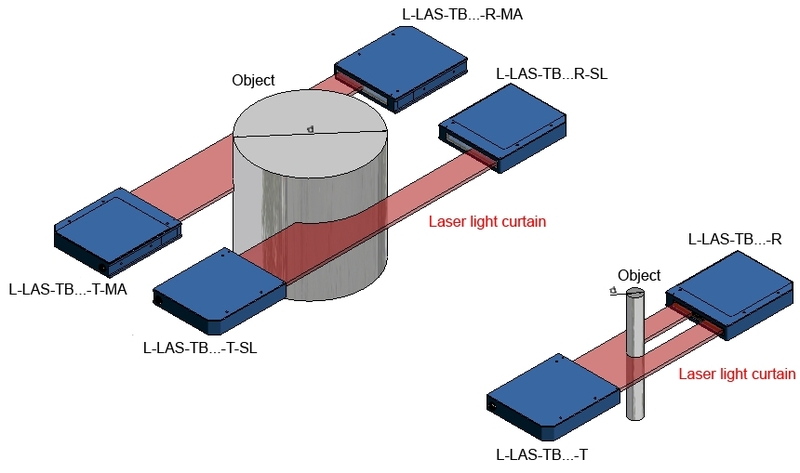 The width of film can be measured with the L-LAS-TB-… through-beam system or with a master/slave system. 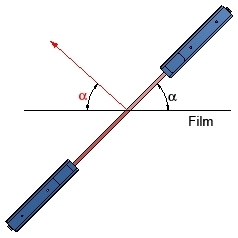 When the transmitter/receiver pair is arranged at an angle the film start and end even can be determined at transparent film. 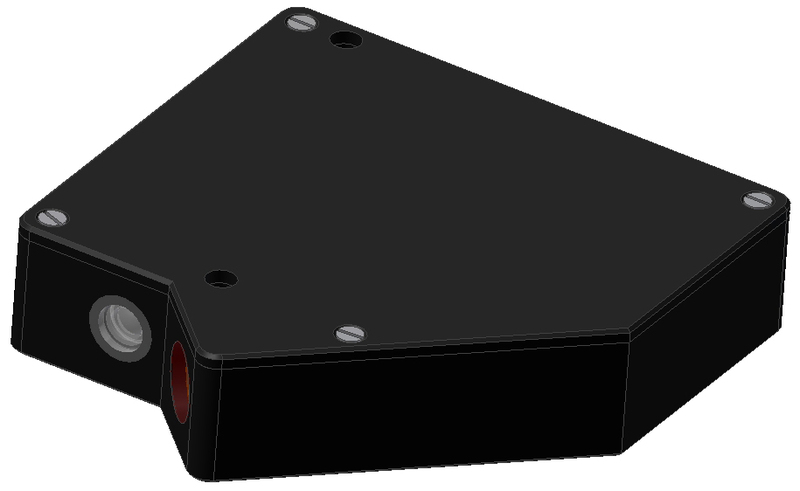 When the sensor unit is arranged at an angle, more light is reflected than in case of vertical arrangement. As a result, and additionally due to absorption by the film, less light arrives at the receiver. 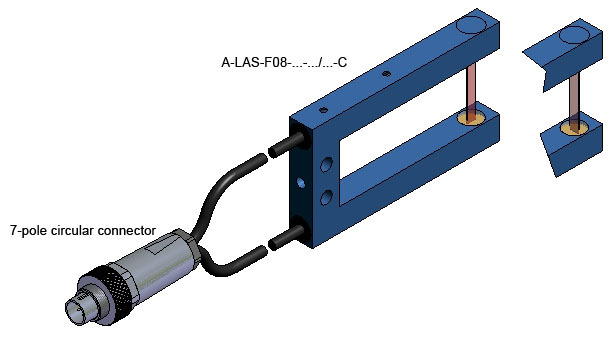 The width measurement of thicker objects also can be performed with a MASTER/SLAVE combination of the L-LAS-LT series. 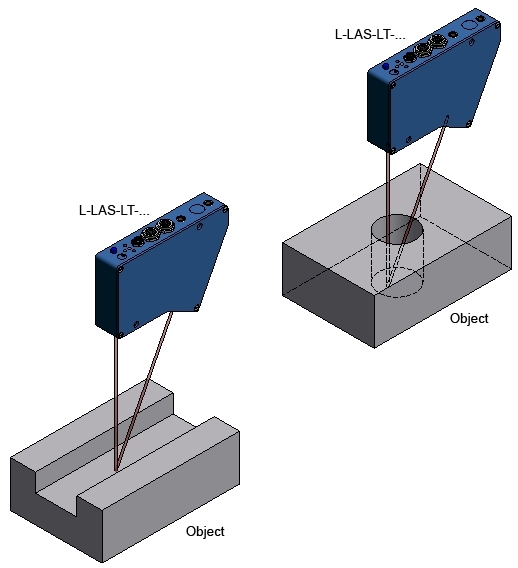 The “SLAVE“ sensor supplies the distance value to the “MASTER“ sensor, which in turn with an offset determines the width of the object. 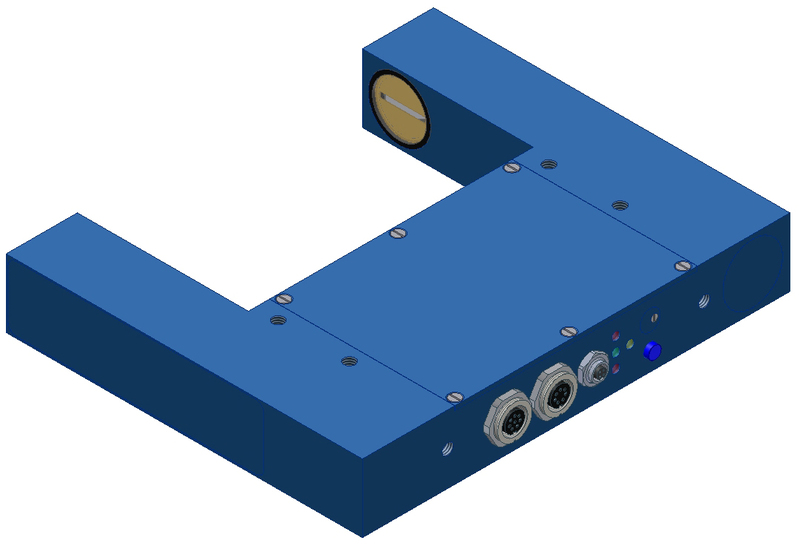 An external evaluation unit thus is not needed for determining the width. The width is provided as an analog signal (voltage 0V…10V or current 4 mA - 20 mA) and as a numeric signal on the digital serial bus. 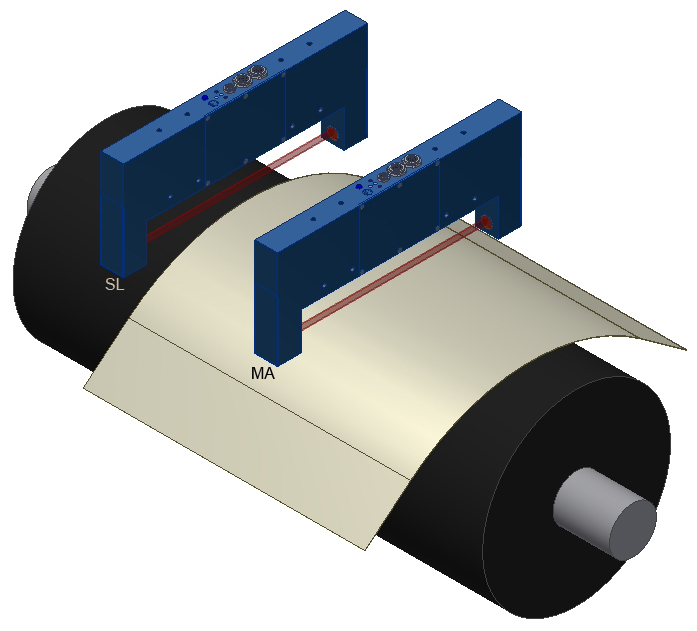 The L-LAS-RL series and the L-LAS-CAM series in combination with the L-LAS-LU series also are suited for the width measurement of film or metal sheets. Special attention must be paid to the object distance from the sensor here, because these sensor systems have a limited depth of focus. 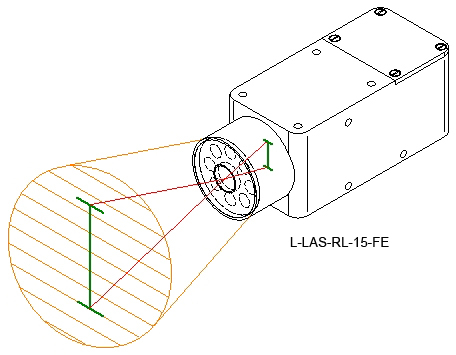 The L-LAS-RL series uses the reflected-light mode, whereas the L-LAS-CAM series in combination with the L-LAS-LU series primarily is intended for through-beam operation. 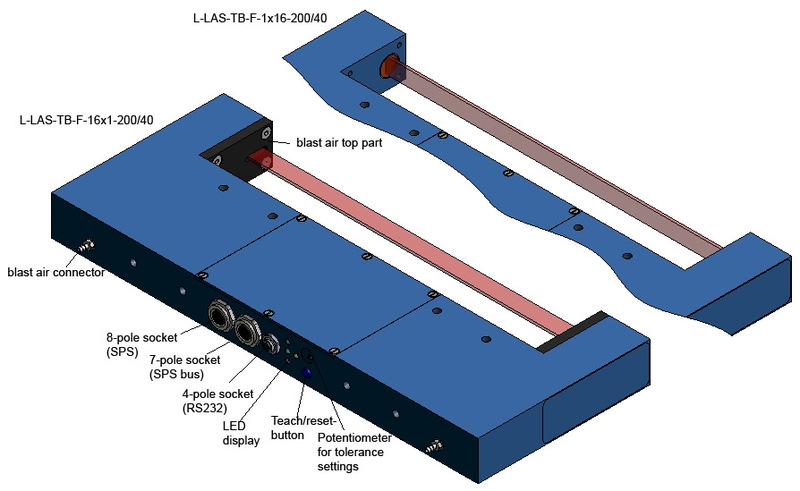 Thickness measurements best can be performed with the L-LAS-LT series in MASTER/SLAVE mode. 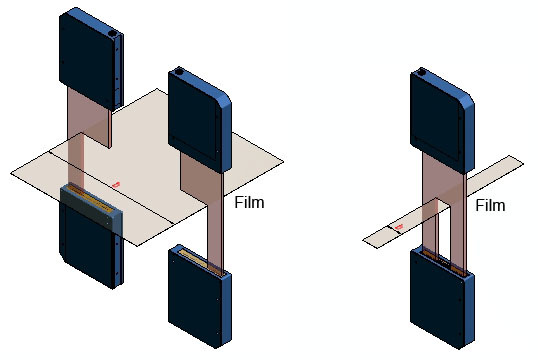 A thickness measurement of film also can be performed with a MASTER/SLAVE combination of L-LAS-TB sensors. 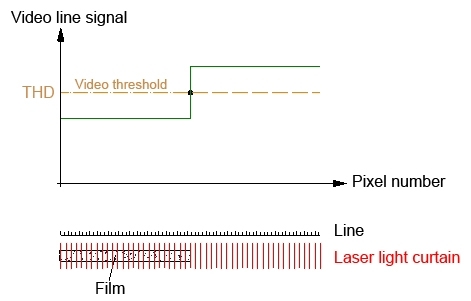 The film is pulled over a roll, and a laser through-beam sensor (MASTER) is directed onto the film + roll, while the SLAVE light barrier only is directed onto the roll. 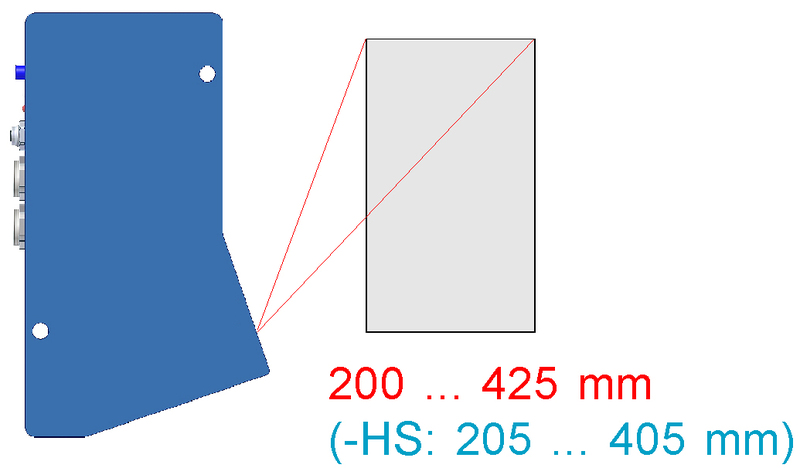 The difference between MASTER and SLAVE sensor provides information about the film thickness. 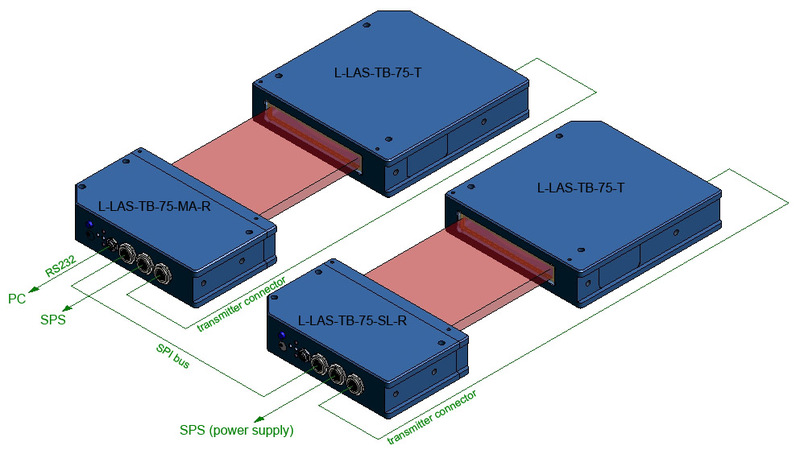 The L-LAS-TB series is suited for gap measurements. 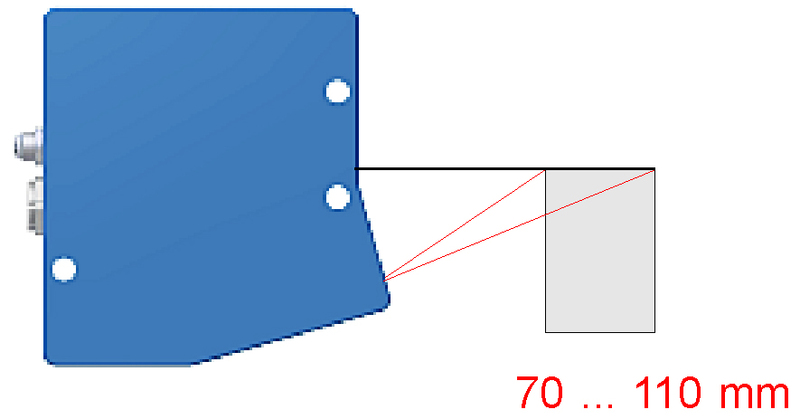 Care must be taken to ensure that the optical axis (laser light curtain) is aligned with the longitudinal edge of the object, because otherwise an additional part of the laser light curtain would be covered and the gap would thus appear too small. The A-LAS series primarily is used with very fast moving objects. The bending of objects can be determined both with the L-LAS-TB series and with the L-LAS-LT series. It is recommended to measure against a reference, which can be realised by way of MASTER/SLAVE operation. 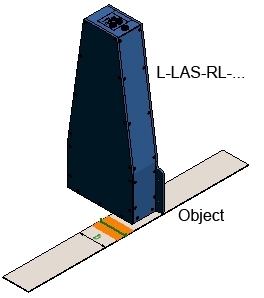 The elongation of an object can be determined with a through-beam system of type L-LAS-TB-… or a reflected-light system of the L-LAS-LT series, each in MASTER/SLAVE arrangement. 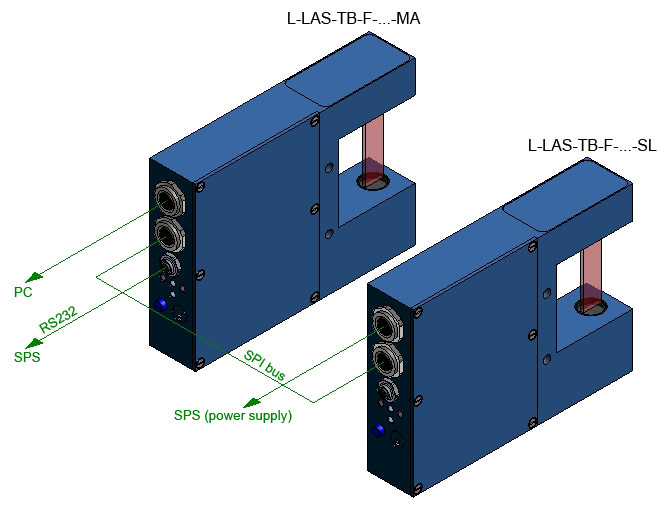 Length measurements also can be realised with a MASTER/SLAVE through-beam system of the L-LAS-TB series. 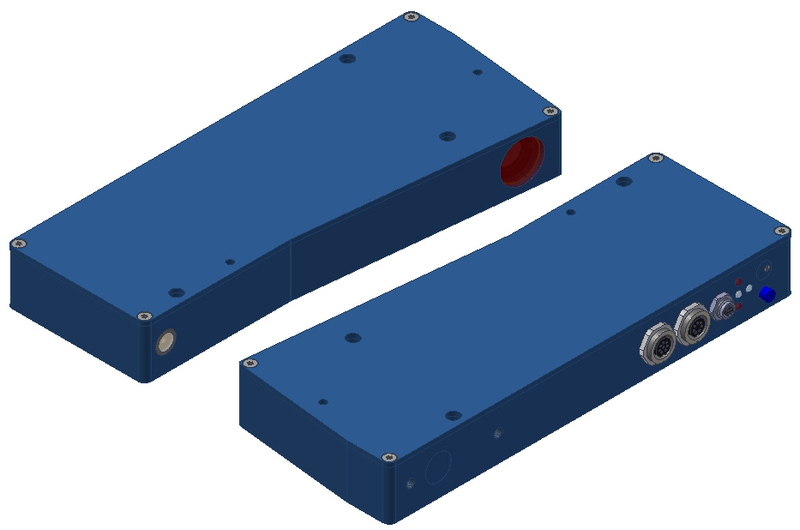 The length is determined from the two edge positions plus a constant offset value that results from the distance of the two sensors with respect to each other. 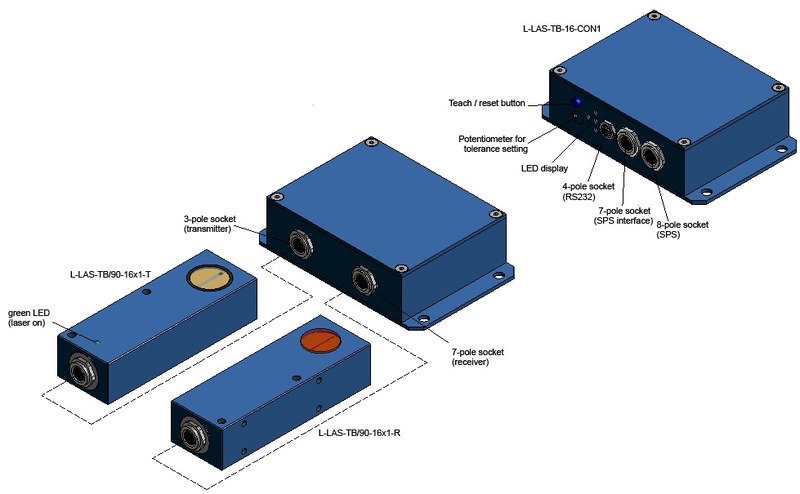 The same applies to an arrangement with triangulation sensors. Essentially through-beam measurement can be performed with the A-LAS series and the L-LAS-TB series. Both series are available with a separate transmitter and a receiver unit. 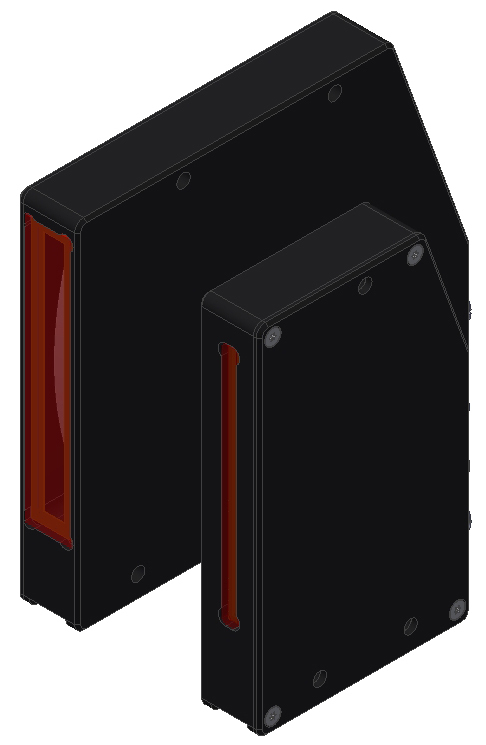 In the fork version transmitter and receiver unit are contained in the same housing. 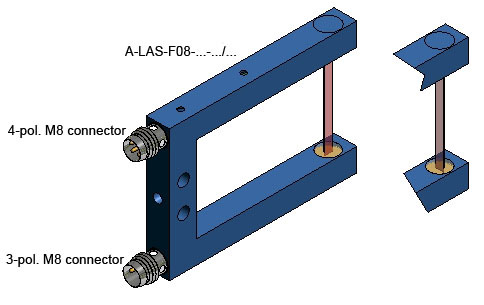 Due to the telecentric beam path of the transmitter unit measurement can be performed between transmitter and receiver unit almost independently of the measuring position. 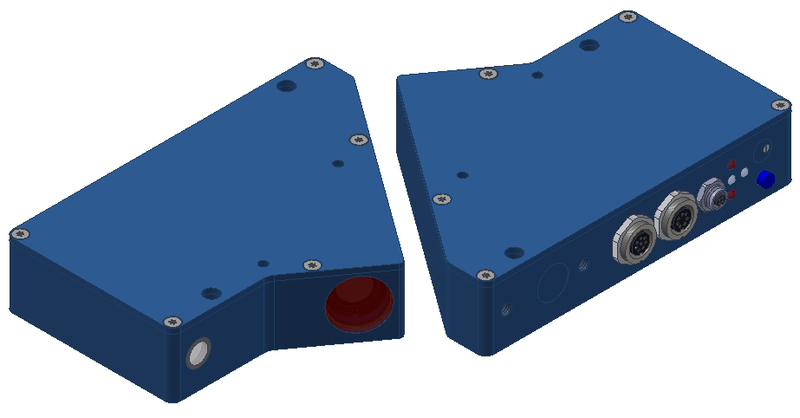 Through-beam systems of this type have a much higher depth of focus than reflected-light systems. 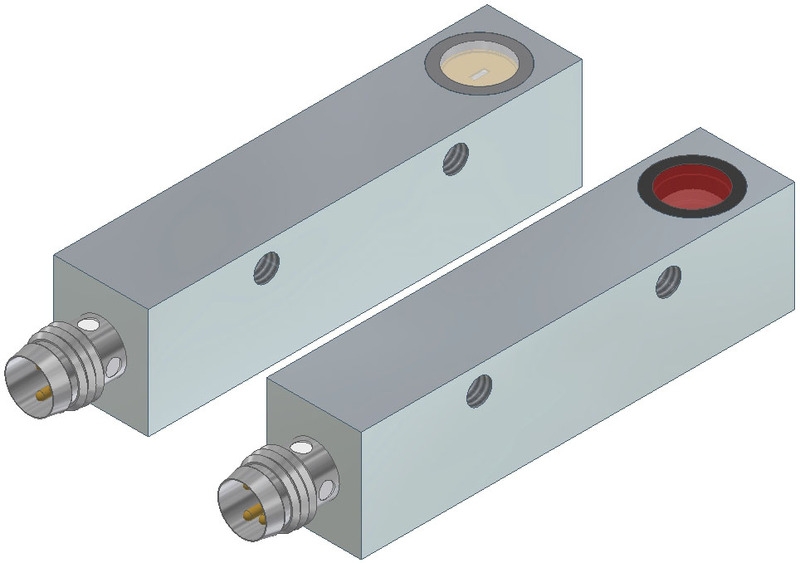 These sensors are differentiated into reflected-light sensors that from a certain object distance project a line section on a detector line by means of a projection lens (the line signal for example provides information about an edge position or a wire position, and this type of sensor also is used for sheet doubling control), and triangulation sensors (transmitter, object, and receiver are arranged in a triangle form). 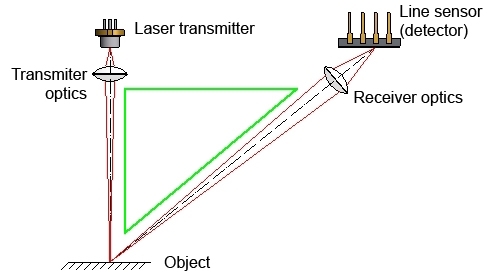 In triangulation sensors the laser spot that is projected onto the surface by the transmitter optics is mapped on the line detector by the receiver optics. 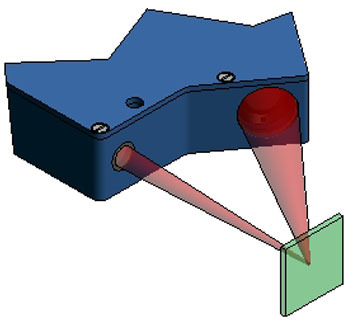 The position where the laser spot impinges on the line provides information about the distance of the object surface from the sensor. Operating distances of 35 mm, 50 mm, 75 mm and 125 mm. 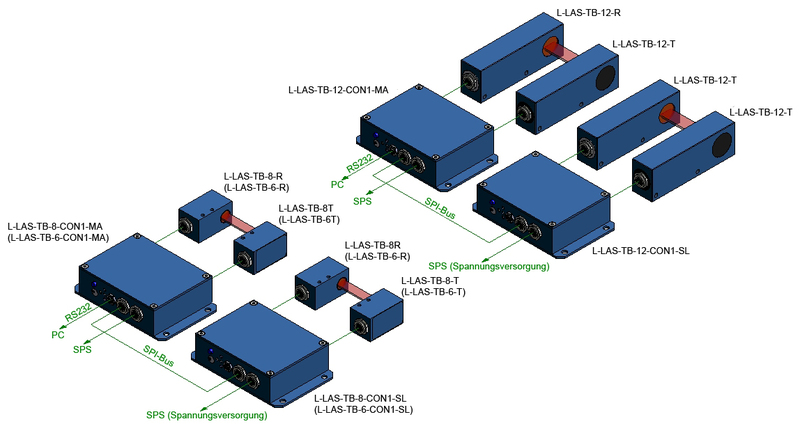 The L-LAS-LT series is differentiated into so-called SINGLE types and MASTER/SLAVE systems. MASTER/SLAVE systems also can be used to determine the thickness and inclination of objects. 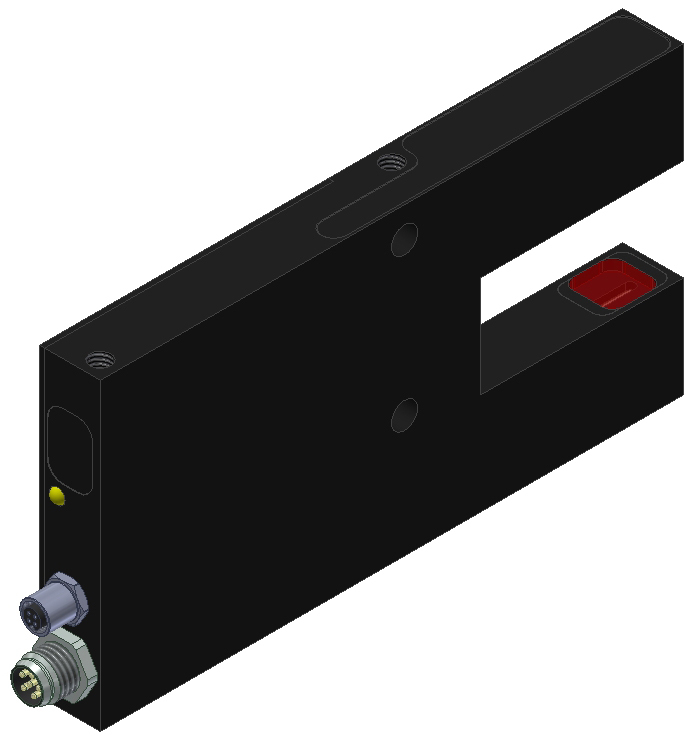 The SLAVE sensor in this case supplies the measured distance value to the MASTER sensor. 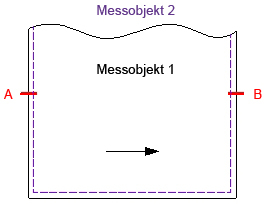 From the two distance values the MASTER sensor then calculates the thickness or inclination of the object. 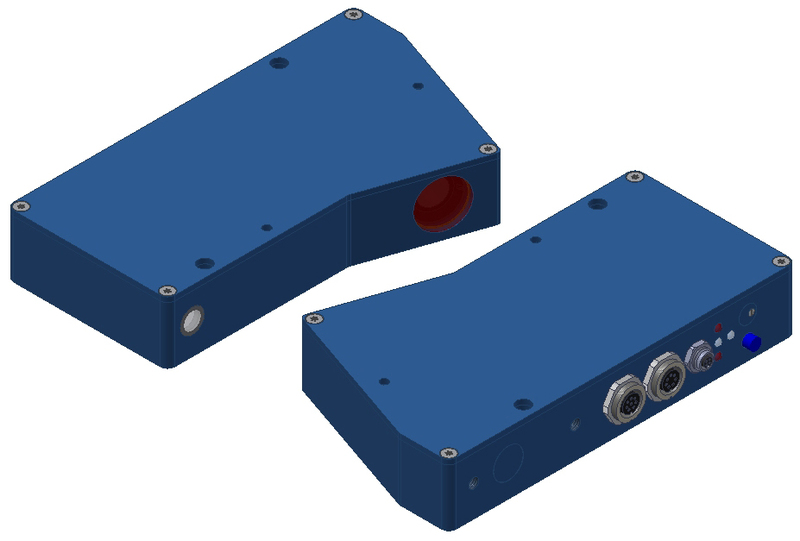 These control units can be used for all the sensors of the A-LAS series. 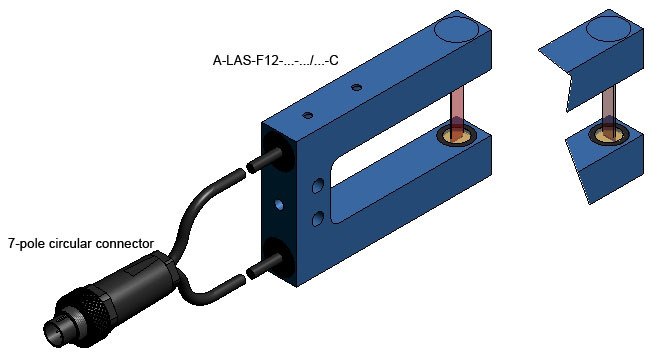 The sensors of the A-LAS series are available both as split versions and as fork versions. 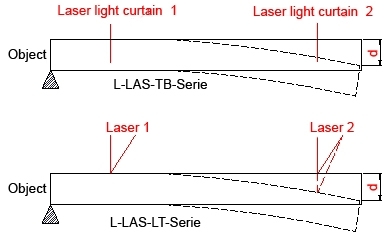 The cross-section of the laser light curtains (aperture) starts at approx. 0.1 mm x 0.5 mm or diameter 0.2 mm, and ranges up to a size of 100 mm x 5 mm (transmitter side). 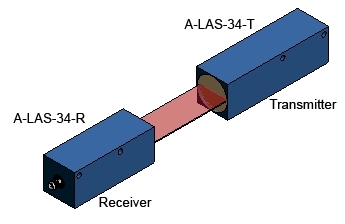 All the laser transmitters of the A-LAS series operate with parallel light, in the standard types the wavelength of the laser light lies in the red range. 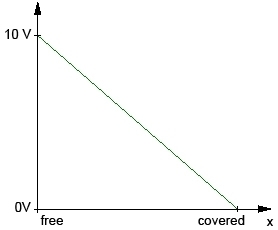 The recommended maximum transmitter/receiver distance depends on the size of the transmitter aperture. Recommended max. 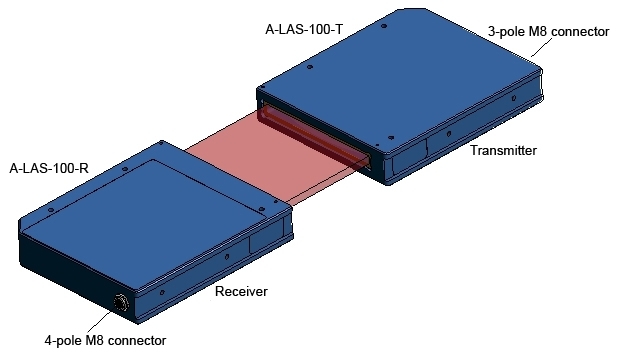 transmitter/receiver distance = 1000 x aperture size of the transmitter (with rectangular transmitter apertures the small axis is used as a measure). The control unit is connected to e.g. 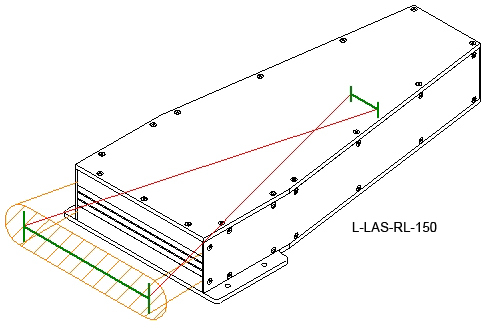 a PLC by means of an 8-pole cable. The analog signal at the output of the control unit is proportional to the non-covered area of the laser light curtain. With the potentiometer that is integrated in the amplifier the sensor in non-covered state for example can be set to +10V. The green LED indicates that the amplifier is on, the red LED indicates that the A-LAS sensor is dirty or covered for a longer time. The analog bandwidth is approx. 200 kHz. 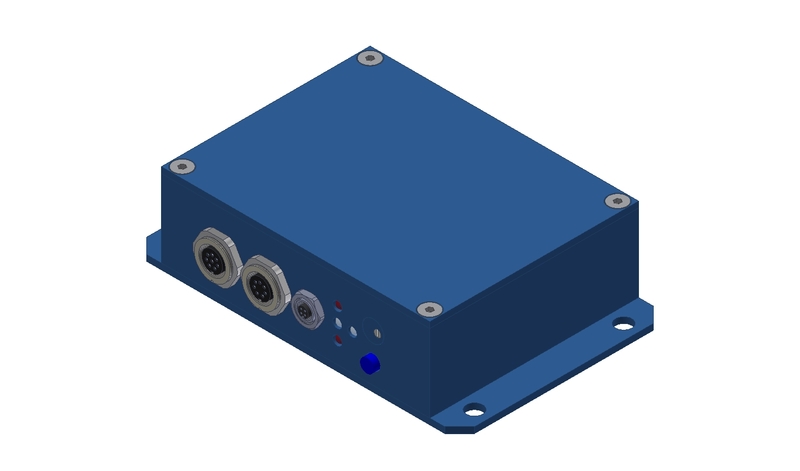 (0V…+10V) the control unit also provides two static digital outputs and two dynamic digital outputs. The analog bandwidth is 100 kHz. 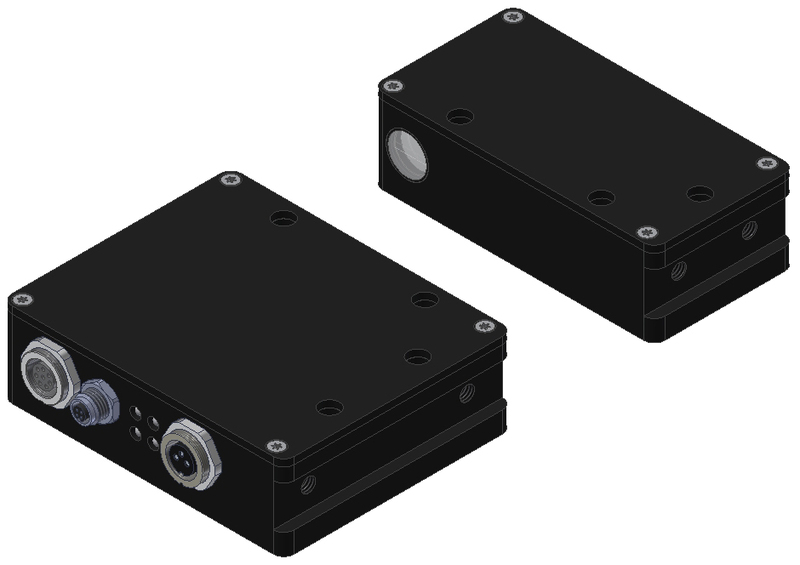 The digital outputs have a switching frequency of 25 kHz, in case of the HS version 300 kHz. 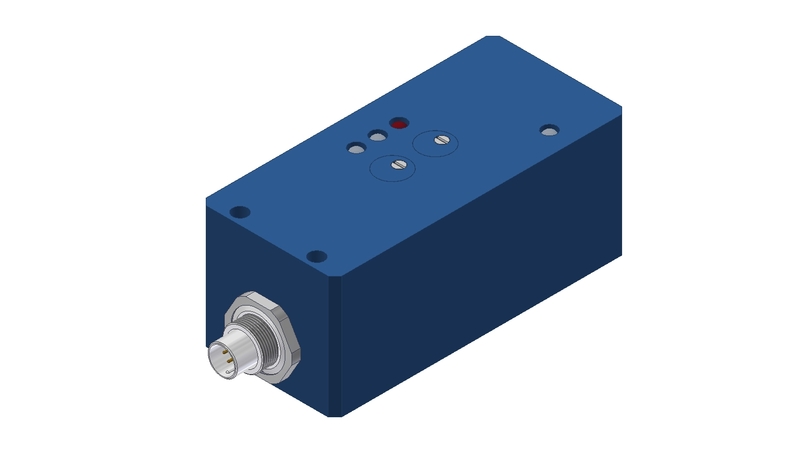 With the potentiometer for the gain factor the analog output can be set to 10V (laser light curtain not covered). 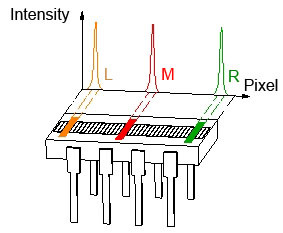 The second potentiometer is used to set the sensitivity. Automatic threshold correction for the purpose of dirt accumulation compensation can be activated by means of a jumper in the amplifier. 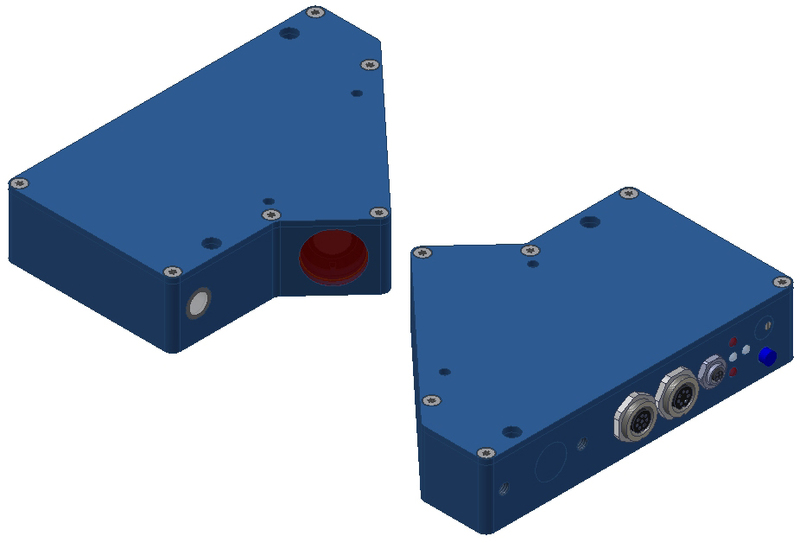 A-LAS-CON1 is a microcontroller-based control unit that can be used to simultaneously control two analog laser sensors of the A-LAS series. The analog signals of the two A-LAS sensors are scanned with a frequency of up to 25 kHz and are then digitised. The digitised measurement values are then evaluated at a PC under Windows® in a way that can be set up by the user. Several functions are available for this, e.g. also a mathematic combination of the two analog signals. 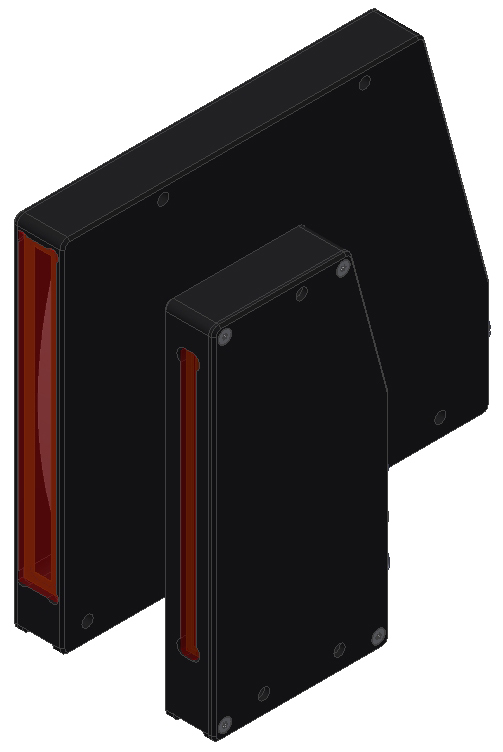 Through an 8-pole socket the A-LAS-CON1 control unit is supplied with a supply voltage between 18V and 32V. The current channel states can be output by way of three short-circuit-proof, freely configurable (under Windows with a PC) digital outputs. 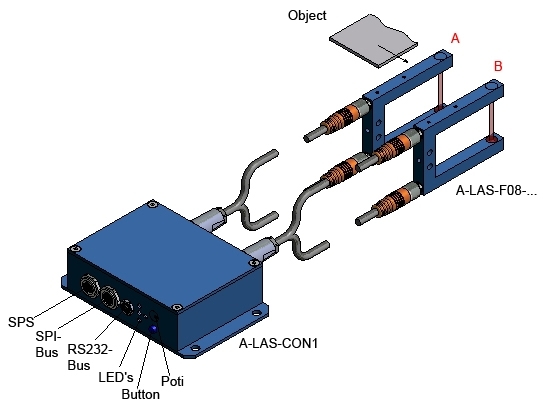 The output switching states are visualised by 4 LEDs at the housing of the A-LAS-CON1 control unit. 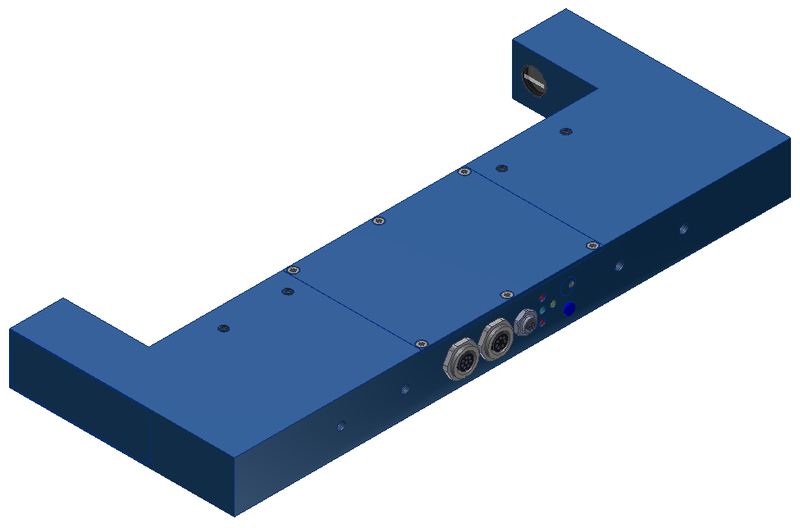 Two digital inputs allow external triggering for controlling measurement value scanning, and external teaching for setting the tolerance bands. 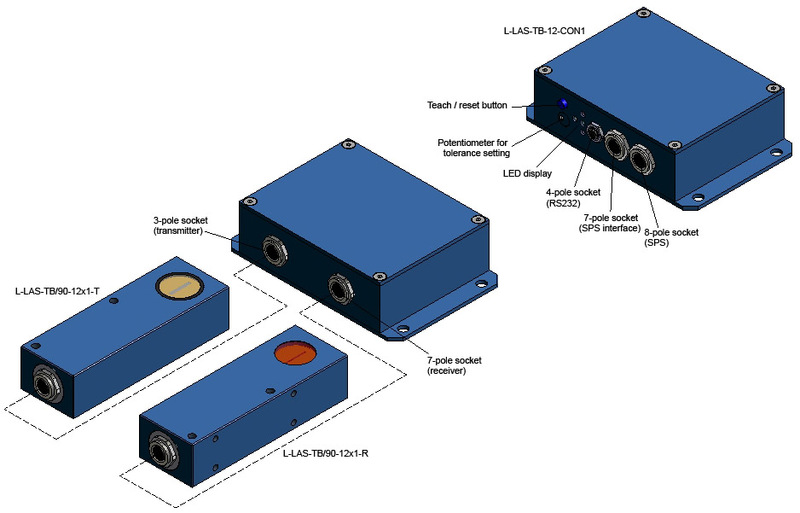 A high-speed 0V – 10V analog output (up to 10 kHz) also is available. 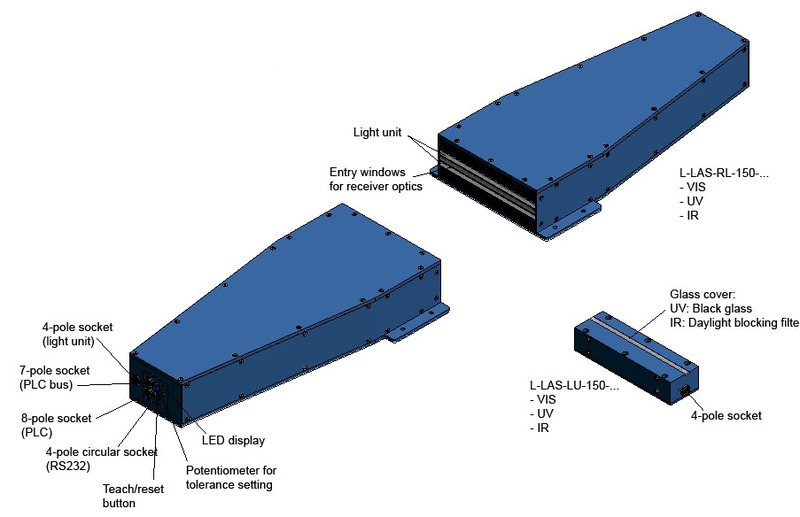 Under Windows® the control unit is configured such that channel A is used for measuring, and channel B for triggering. 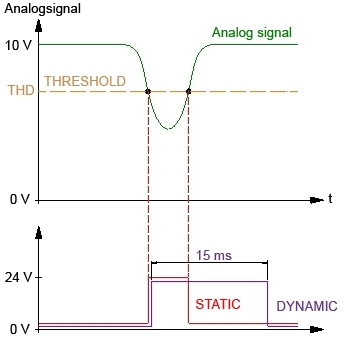 For example, the trigger threshold of channel B can be set to 50%, and at exactly this trigger time channel A is checked for whether the measurement signal lies within the specified tolerances or not. 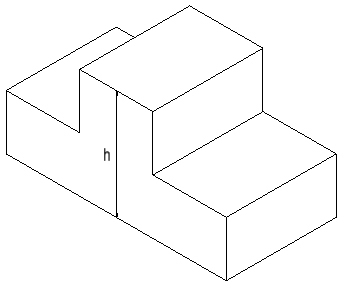 (Object 1 lies within the tolerance, object 2 lies outside the tolerance). 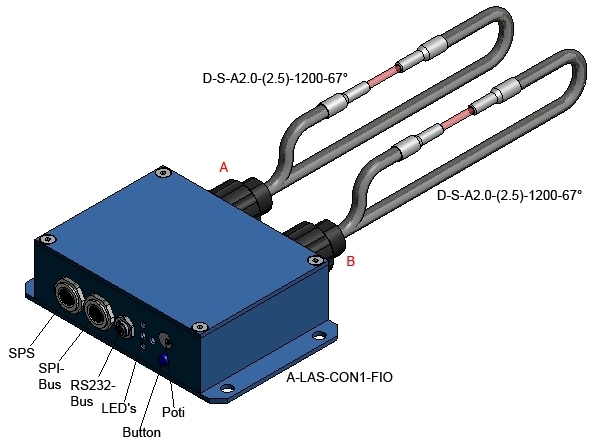 The A-LAS-CON1-FIO control unit also features two sensor input channels, but in this version the laser transmitter and receiver electronics incl. 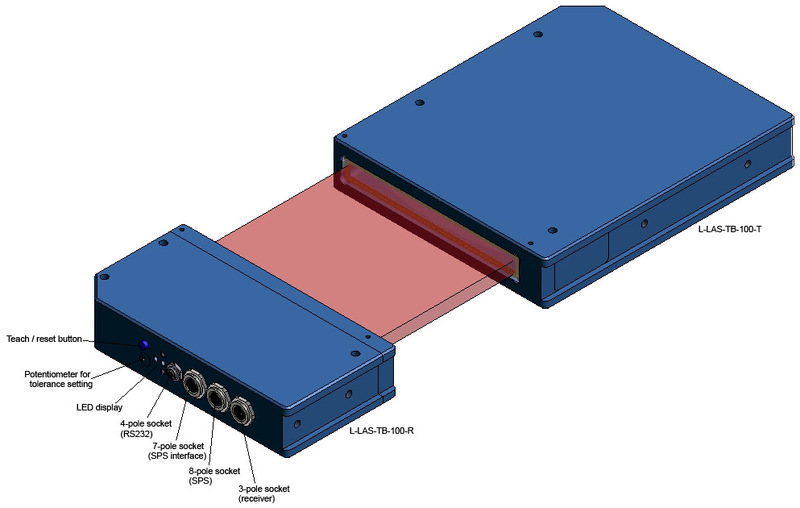 optical filters are integrated in the control unit. 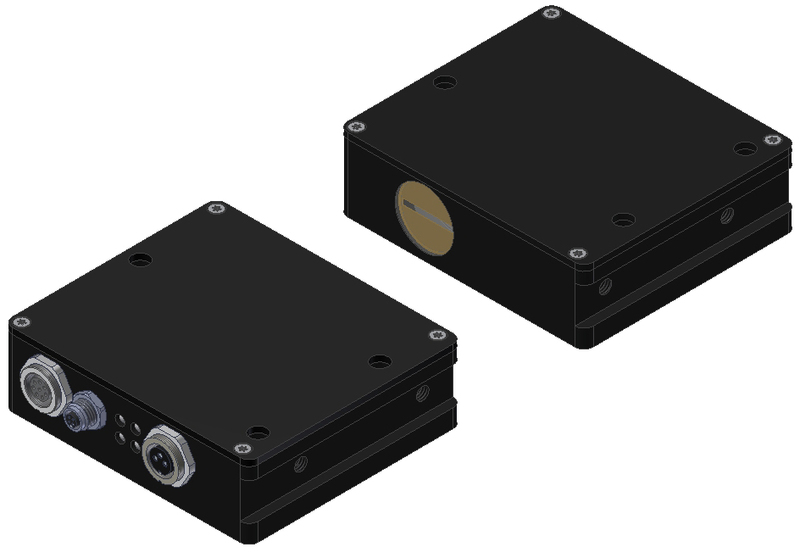 The sensor frontends here are through-beam optical fibres of the FIO series (D-…). 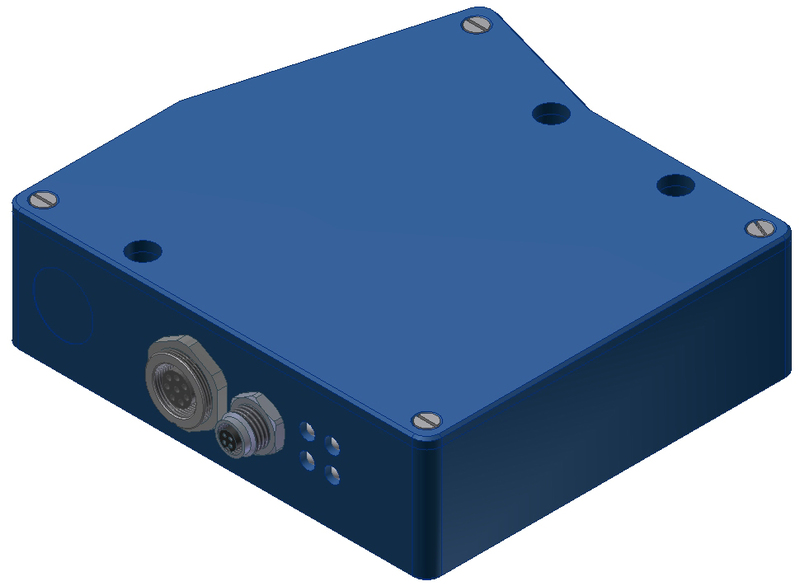 This control unit offers advantages if space is limited at the measurement location, or for applications in Ex areas. 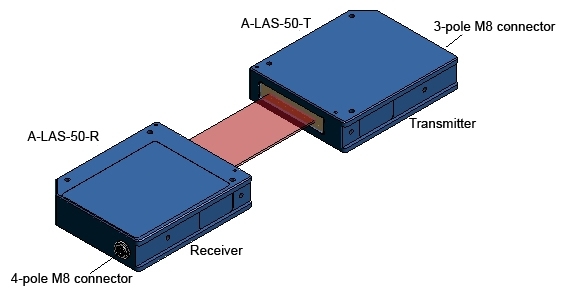 Configuration of the A-LAS-CON1-FIO is performed through the integrated RS232 interface. The control unit can be parameterised at a PC under Windows® with the A-LAS-CON1-Scope software. Through an 8-pole socket the A-LAS-CON1 control unit is supplied with a supply voltage between 18 V DC and 32 V DC. The states of the individual channels can be output by way of three short-circuit-proof, freely configurable digital outputs (OUT 0, OUT 1, OUT 2). Two digital inputs can be used for external triggering and external teaching. 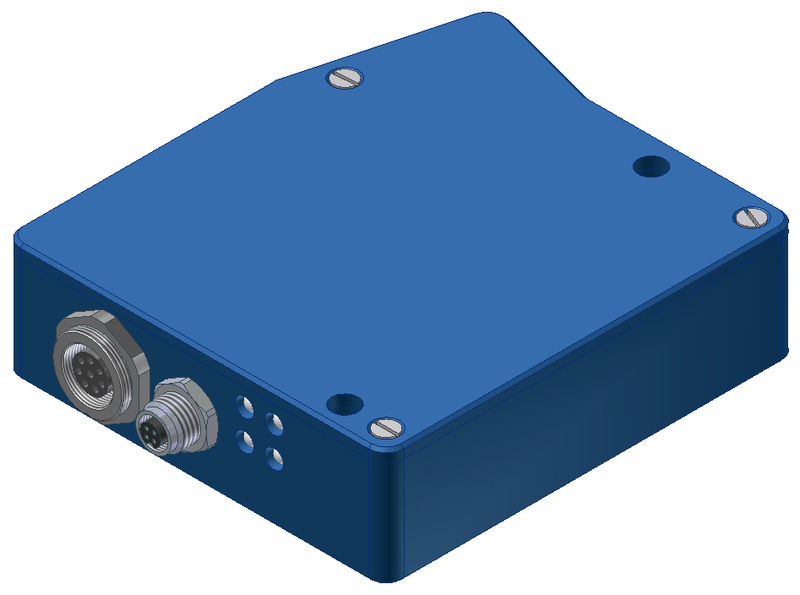 An analog output (0V…10V, bandwidth 10 kHz) allows the external monitoring of the sensor signals. 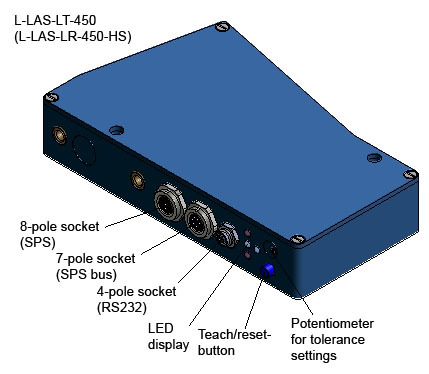 When enabled, external teaching can be performed with the integrated potentiometer and button, and the tolerance also can be set with the potentiometer. 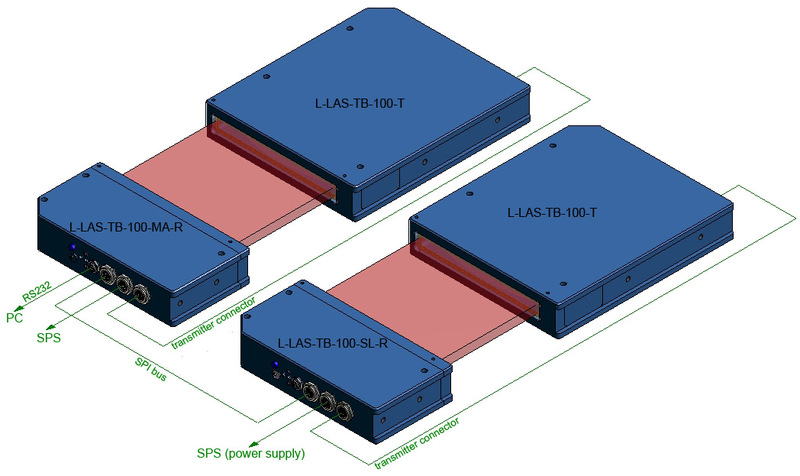 The L-LAS-TB series can be classified into so-called SINGLE systems and MASTER/SLAVE systems. With SINGLE systems one measuring point can be evaluated, while with MASTER/SLAVE systems 2 measuring points are available. 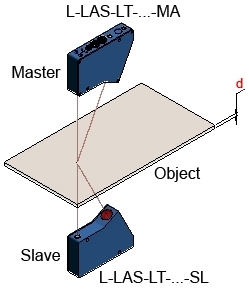 The SLAVE sensor supplies the position data to the MASTER sensor, which in turn calculates the distance value. 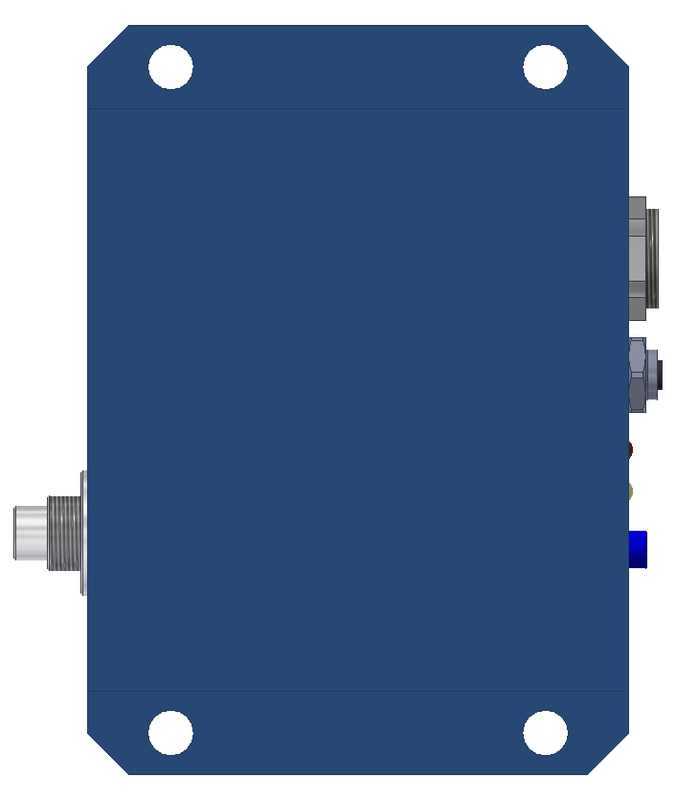 Due to the compact transmitter / receiver design the control unit in these types is contained in a separate housing. 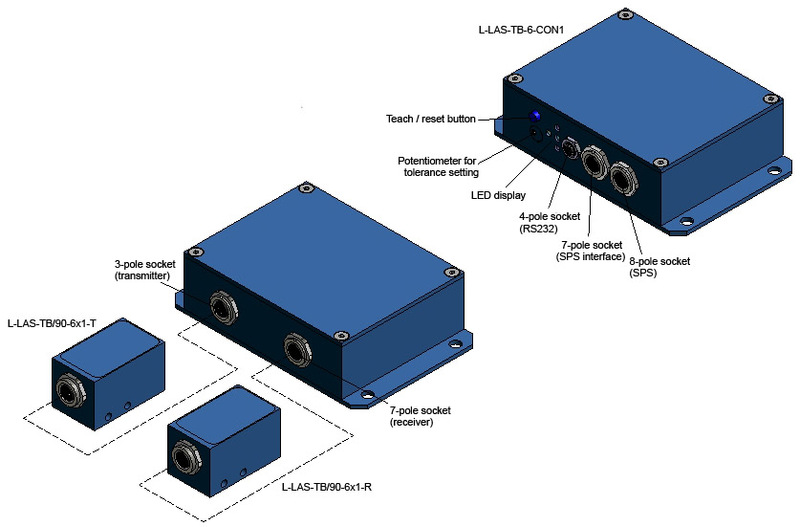 In these types both transmitter and receiver plus control unit are integrated in one housing. 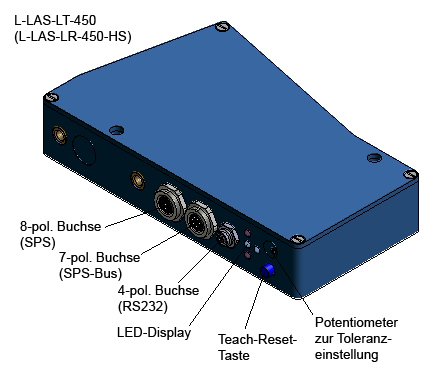 Data exchange between MASTER and SLAVE sensors is effected through the SPI bus (digital-serial bus). 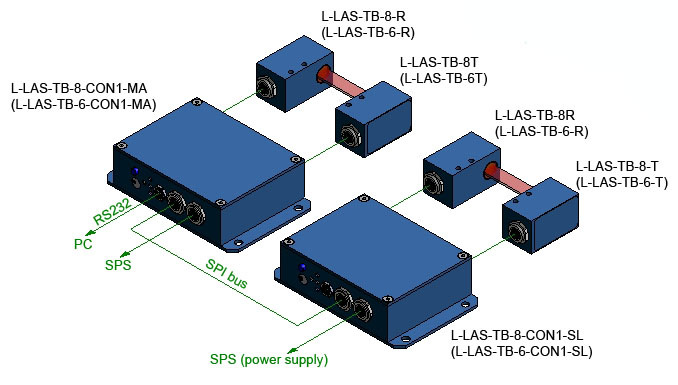 At each sensor the SPI bus is provided by way of a 7-pole circular socket. 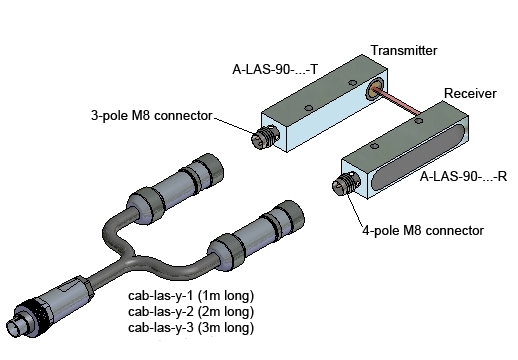 The two sensors are connected by means of the cab-las-7-male connecting cable that is available in different lengths (1 m, 2 m, 3 m and 0.5 m). The technical data are the same as of the SINGLE systems, only the software and part of the interface electronics are slightly different. The technical data are the same as of the SINGLE systems, the software is optimised for the MASTER/SLAVE types. The interface electronics are slightly modified. The technical data are the same as of the SINGLE systems, the software was matched to MAISL, and the interface electronics were adapted. The technical data to a large extent are the same as of the SINGLE systems, only parts of the software were adapted to MASTER/SLAVE operation; the interface electronics also was optimised for MASTER/SLAVE operation. 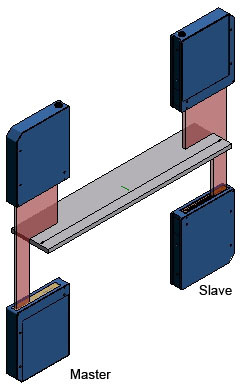 As with the split types, fork types also are available as MASTER/SLAVE systems. Compared to the SINGLE systems the software and the interface electronics have been adapted here. 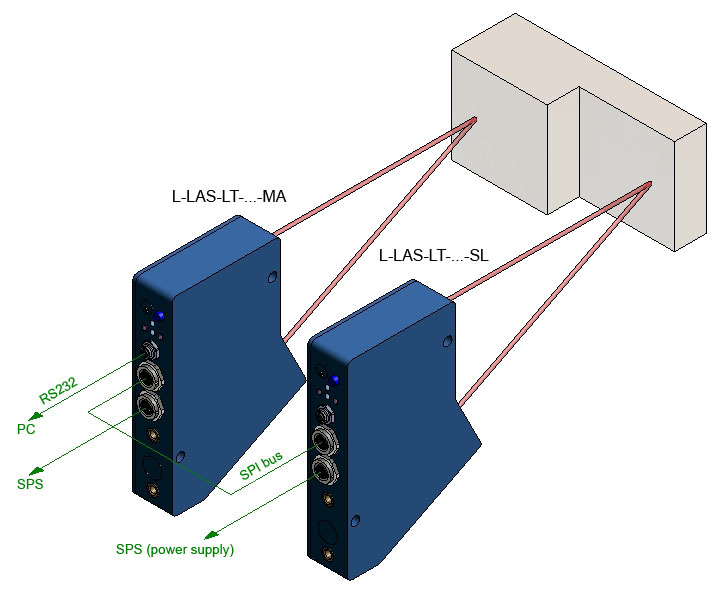 In the L-LAS-LT series a differentiation is made between so-called SINGLE types and MASTER/SLAVE systems. 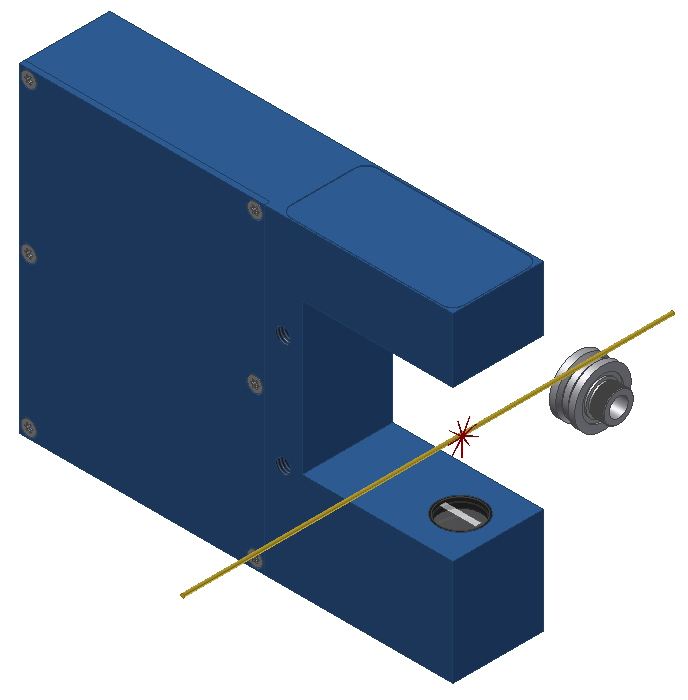 The SINGLE types can be used to measure the distance of an object from the sensor, whereas with the MASTER/SLAVE systems the thickness and inclination of objects also can be determined. 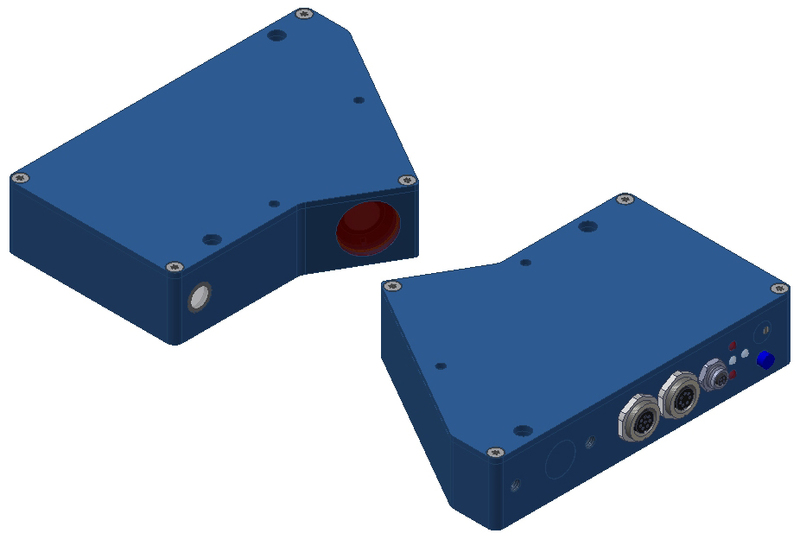 The SLAVE sensor supplies the measured distance value to the MASTER sensor, which then calculates the thickness or inclination of the object from the two distance values. The technical data for the most part are identical with those of the SINGLE types, only parts of the software and of the interface electronics were modified for MASTER/SLAVE operation. 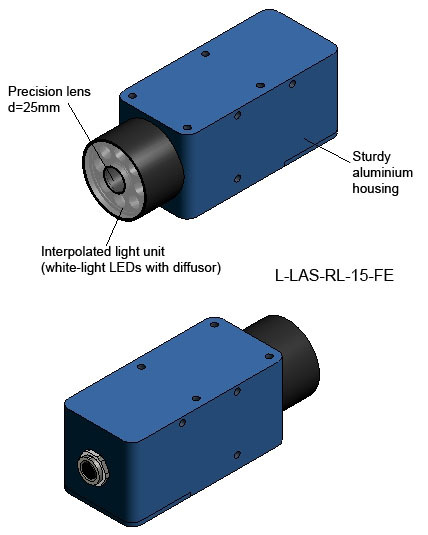 The sensor systems of the L-LAS-RL series are equipped with a line camera with precision lens and with an LED light unit that is available with UV light, white-light, and IR light. Corresponding filters are available for the camera lens. All the components are contained in a highly robust aluminium housing, optics and light unit are protected by a scratch-proof glass cover. 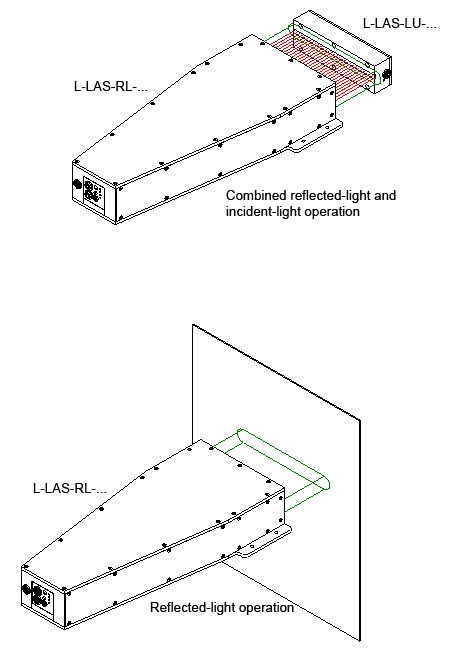 As an option the L-LAS-RL series also can be operated with external light units of the L-LAS-LU series, which also are available as UV, white-light, and IR types. 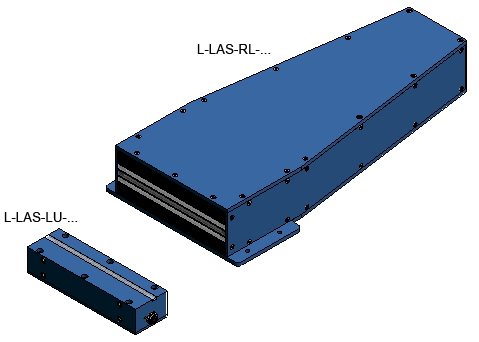 The measuring ranges of the individual L-LAS-RL types lie between 15 mm and 500 mm.